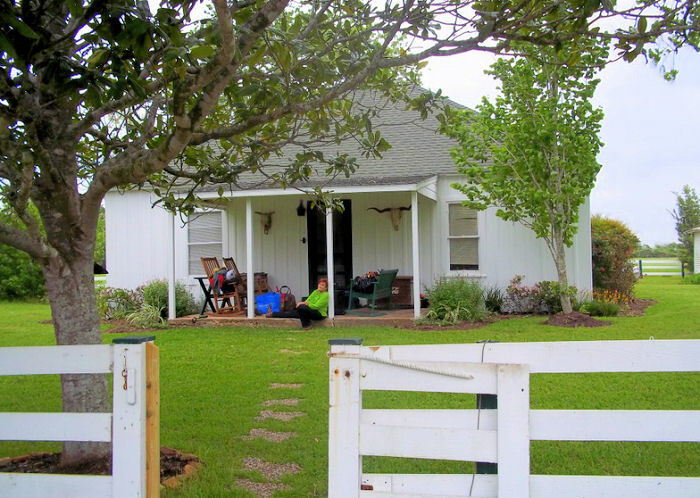 In Marble Falls, at the intersection of 281 and 1431 – take 1431 east for approximately 9 miles, then turn right on County Road 343A and go approximately one mile on 343A which takes you to the park headquarters/entrance. Overnight Equestrian Camping is allowed. The cell phone service was fair to good. 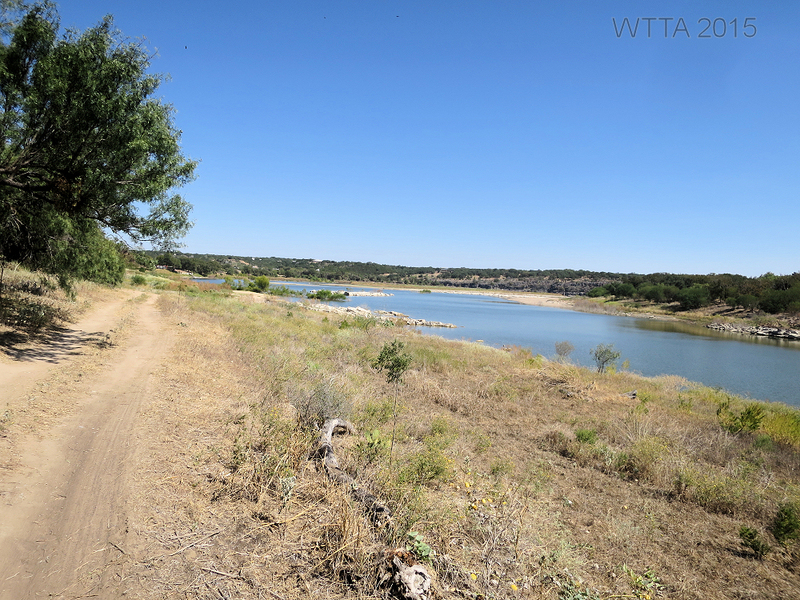 View of Lake Travis which is fed by the Colorado River from Shaffer Bend Campsites 15 – 26. There is one restroom at the park entrance. 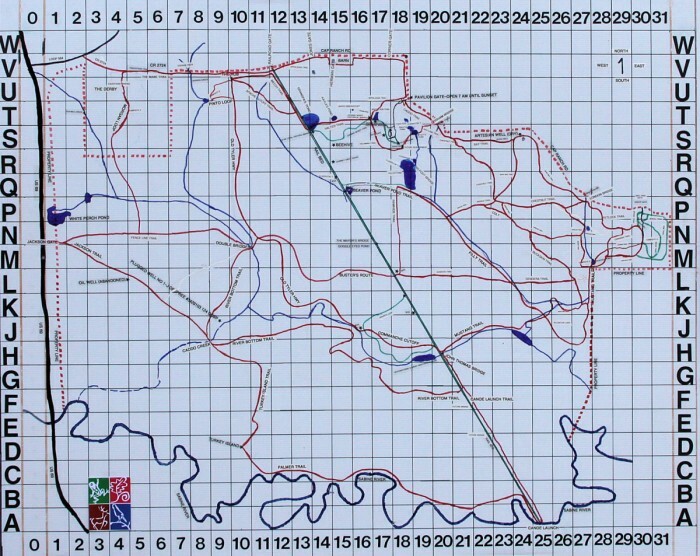 There are a total of 26 designated campsites. 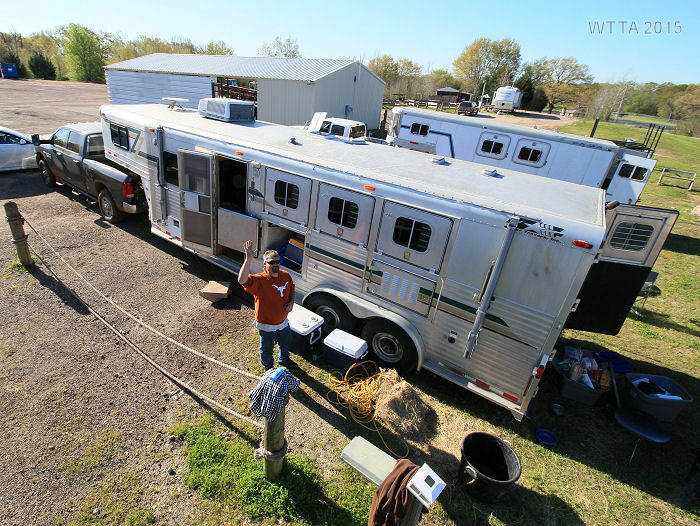 Most of these sites can be used for equine camping but some are more suited for horses than others. 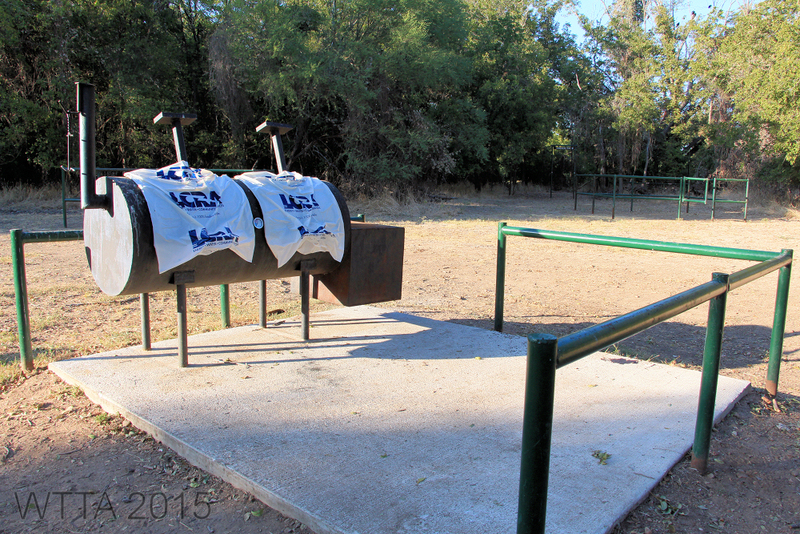 Each site has one or two picnic tables, a fire ring, and a grill. The sites do not have gravel pads or concrete pads to park on, so they will get muddy when it rains. There are no water or electrical hookups. All sites are primitive camping. 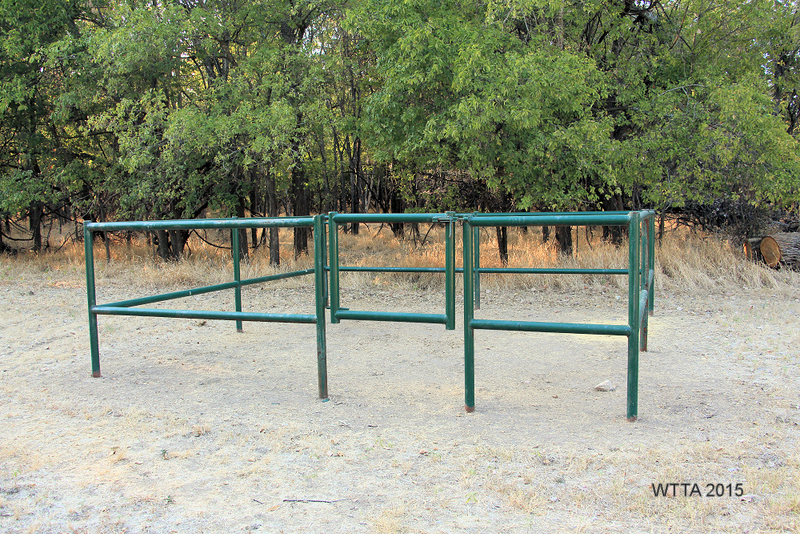 The group campsites #25 – 26 are the only sites with horse pens. There are a total of four uncovered 12 x 12 pipe pens at these sites, picnic tables, at least two very large trees, a fire ring, and a deluxe grill for barbequing. 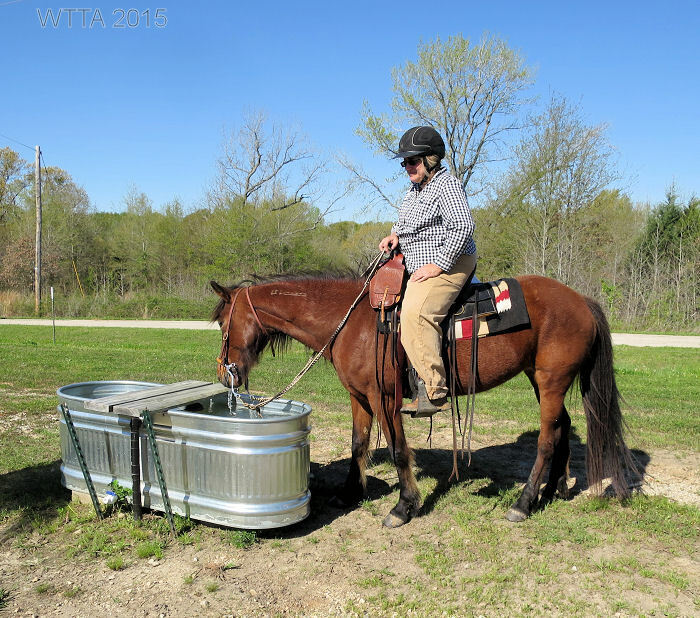 The pens have wide openings between the bottom and top rails and I was sure my little bay mustang would be able to step right through the middle of the pipe fence and then go whereever the grass was the greenest. 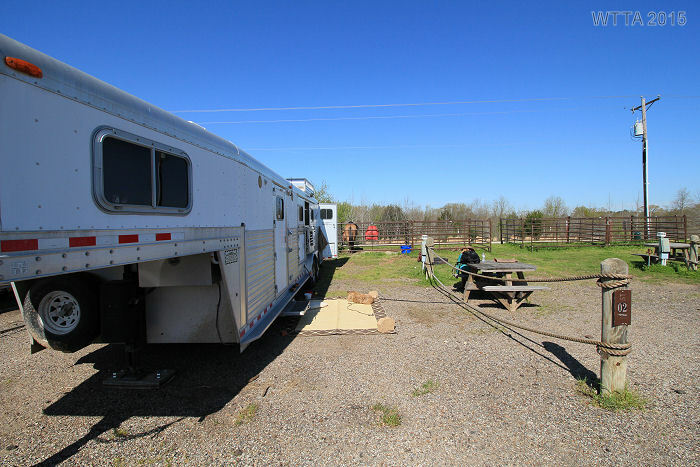 We stayed at site #15 which was perfect for a large rig and we high tied the horses to the trees using tree savers. Sites 15 – 26 are the farthest from the park entrance, about 2.7 miles from the entrance on a mostly gravel road. There is one portable toilet located in the center of these sites. 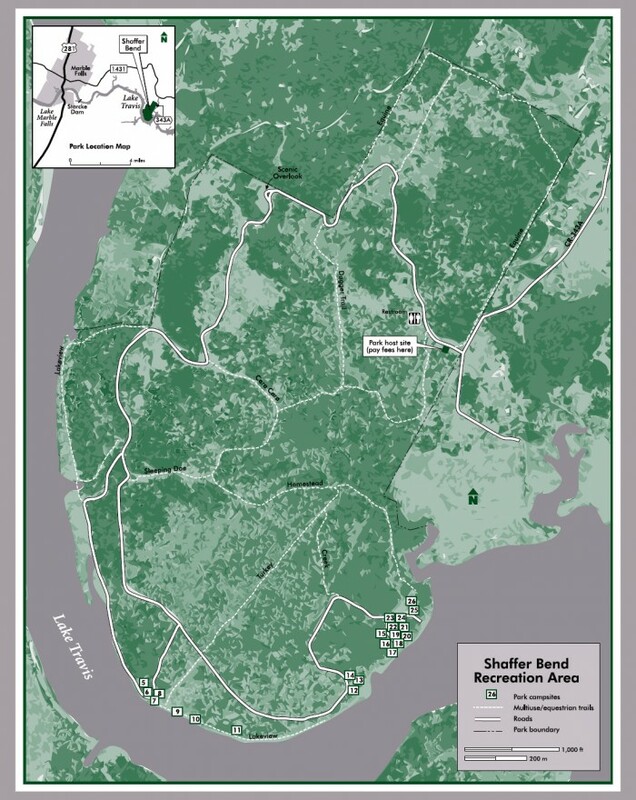 Mileage: Shaffer Bend has approximately 7-8 miles of trails. 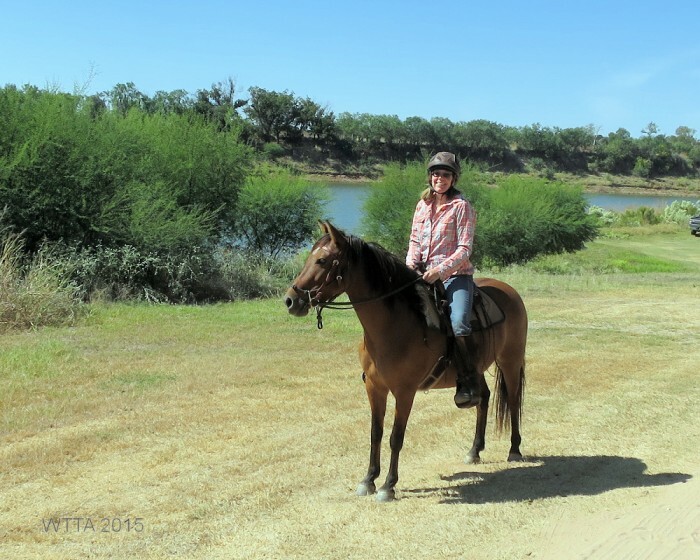 I rode most of the trails on the outer boundaries of the park, taking Lakeview to Cara Cara, to Dagger, to Equine, and then to Homestead Trail. 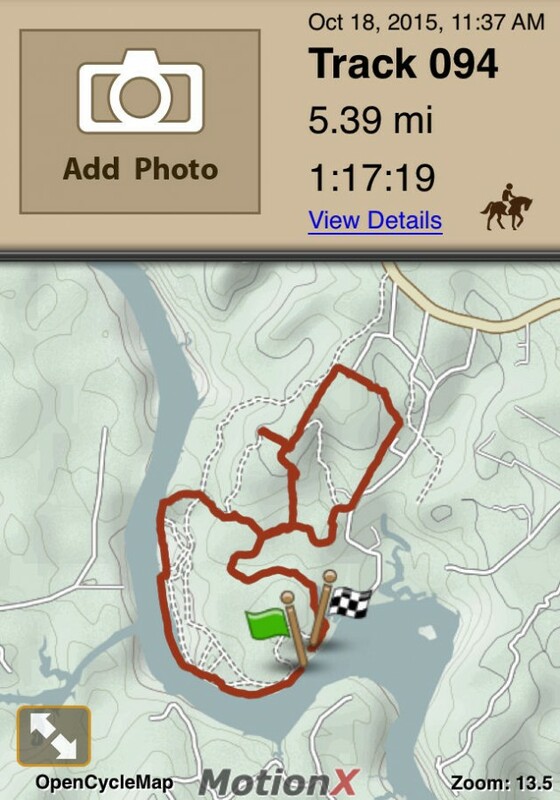 I skipped most of the middle trails on this ride, which totaled just 5.39 miles according to my MotionX app. 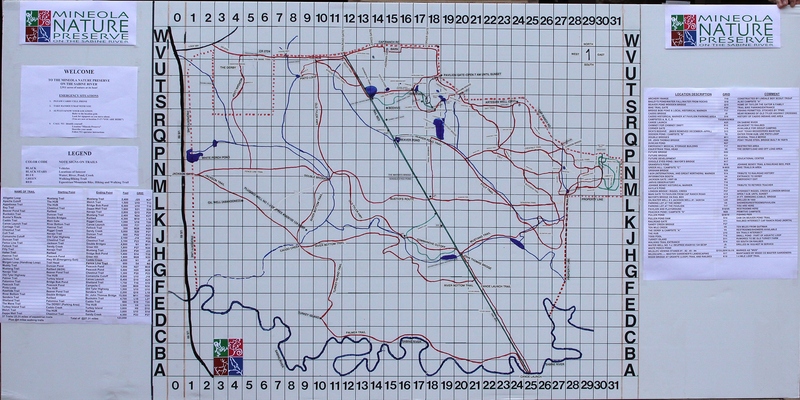 Map: The map below can be requested at the park entrance. Trails / Terrain: The terrain varies from sandy flat and low when closer to the lake and hilly/rocky when further away from the lake. 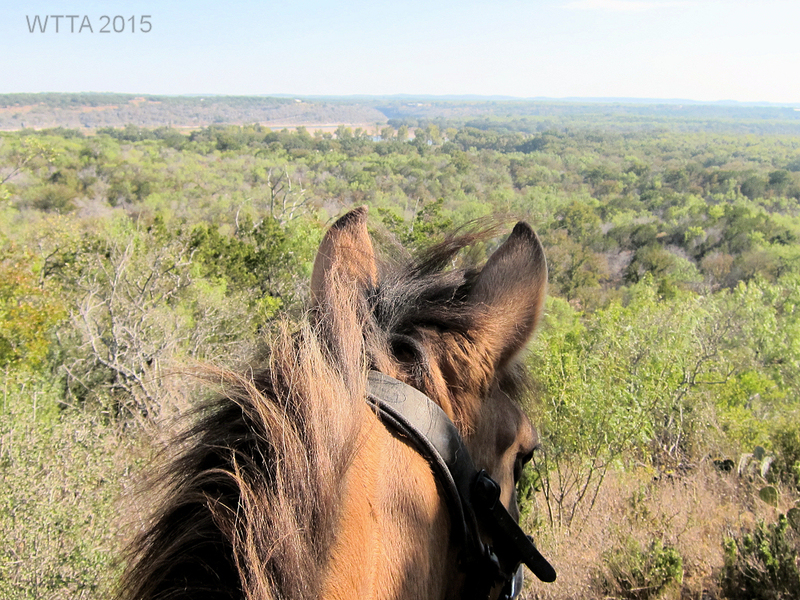 Dagger and Equine Trail are especially hilly, rocky, and have some nice overlook areas. Dagger Trail has a good size rocky hill incline and leads to a beautiful overlook. Several areas on the Equine Trail are rocky and somewhat hilly. This trail follows parts of the park fence line / boundary and so you will be riding behind some houses which are on the other side of the fence. One house has a barn type of structure with several animals (which can’t be seen but can be heard) that my horse got just a little nervous about. There was a length of purple tape along the fence marking this spot, so be ready for a possible spook when you pass this area. 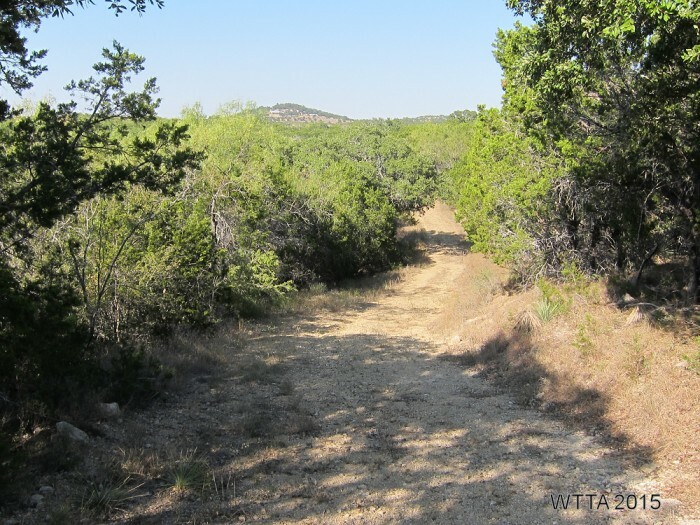 Lakeview Trail is sandy, flat, and offers lake access and great views of the lake. 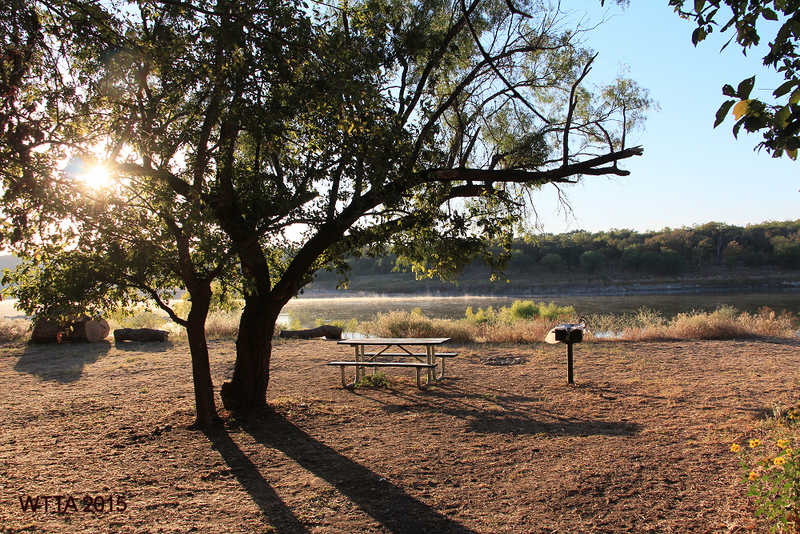 The Homestead Trail will take you from camping sites 25 – 26 to the park entrance. Most of this trail is free of rocks but it is rocky in places and has a few small rolling hills. Cara Cara, Sleeping Doe, Creek, and Turkey Trail are mostly flat and rock free trails. The trails are well marked and easy to navigate. View of Homestead Trail at Shaffer Bend. 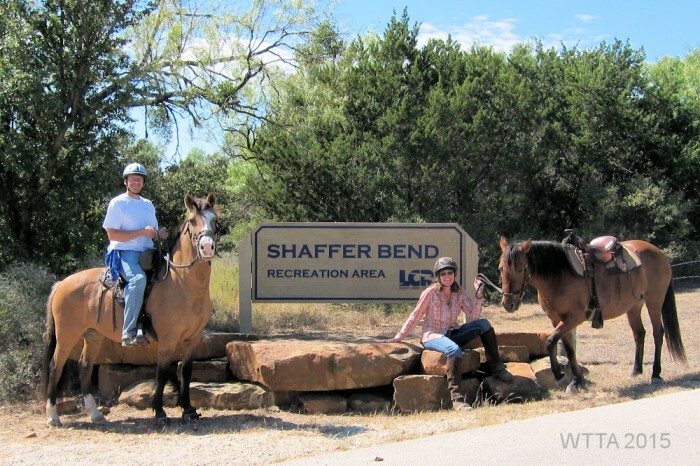 Shaffer Bend Recreation Area is one of several Lower Colorado River Authority parks located off of Lake Travis which is horse friendly. This park consists of 532 acres of lakeside and Texas Hill Country trails. 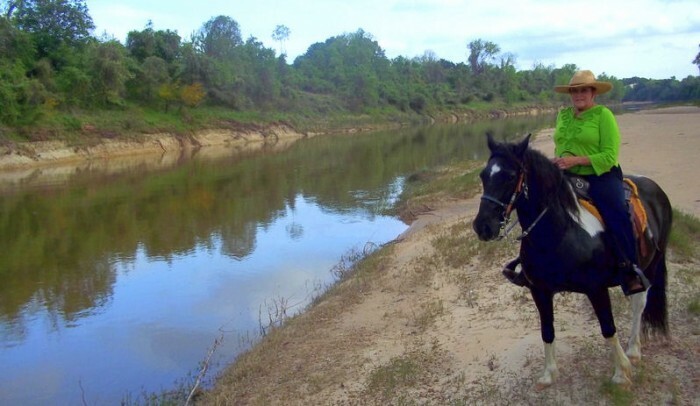 Shaffer Bend is perfect for a day trail ride or a short one or two night camping trip; it won’t take long to traverse the 7 to 8 miles of trail. Although it is a smaller sized park, it is beautiful. There were several campers during our visit in October. At the campsites a few children enjoyed riding their bikes around but we saw no bikes on the trail during our one night stay in the park. We did not see any other horseback riders either. I did pass two groups of hikers while riding on the trails. We also saw a few boats and kayaks in the lake. When you want to get away but can’t be gone for long, this is an ideal spot to visit. Other activities in the park include hiking, biking, swimming, fishing, and boating. Dogs are also welcome as long as you keep them on leash. Be sure to haul in your own water since there is no running water available. 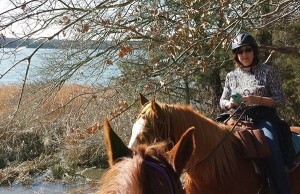 We also took the horses a short walk down from our site to the lake. As you will see from the pictures, they really enjoyed playing in the soft sand and water and munching on the lush lakeside grass. Lakeview Trail at Shaffer Bend. Sleeping Doe Trail and Sign. The trails are well marked at Shaffer Bend. 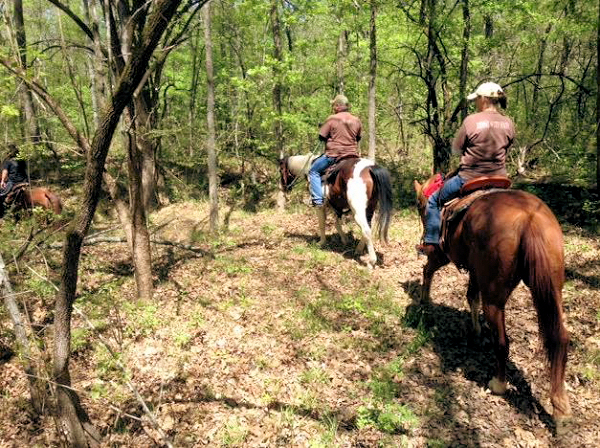 Equine Trail at Shaffer Bend. 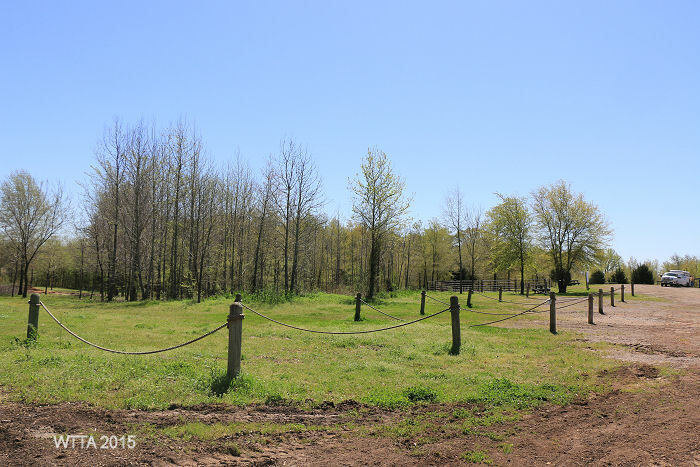 On the Equine Trail by the fence line, keep a look out for the purple tape/ribbon and barns, as your horse might spook here. Bottom of Dagger Trail hill. 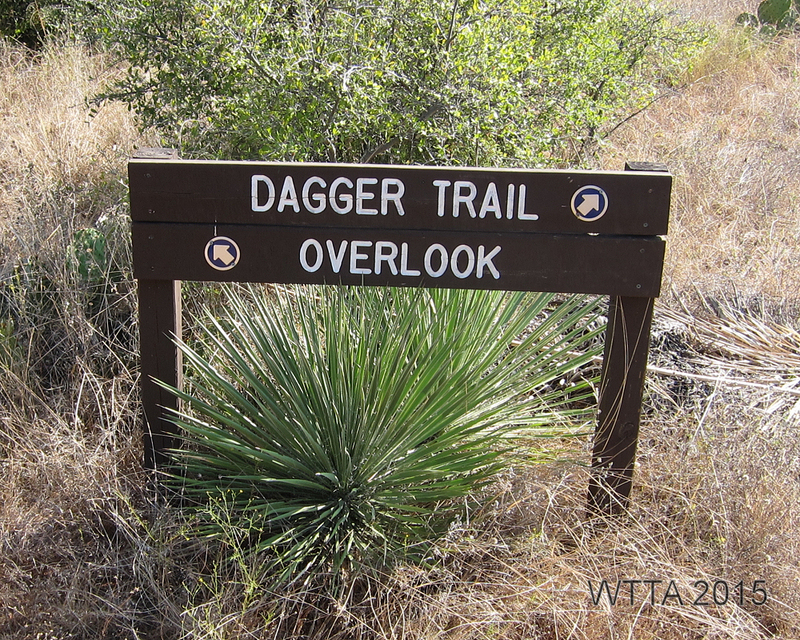 The top of Dagger Trail. Dagger Trail Overlook at Shaffer Bend. Main park road at Shaffer Bend. Our campsite #15 was roomy, shady, and close to the lake. At campsite 15 we high tied the horses in the trees. The group campsites 25 – 26 comes with four pens and a huge barbeque grill. Huge grill at group sites 25 – 26. Due to the burn ban they are covered up. 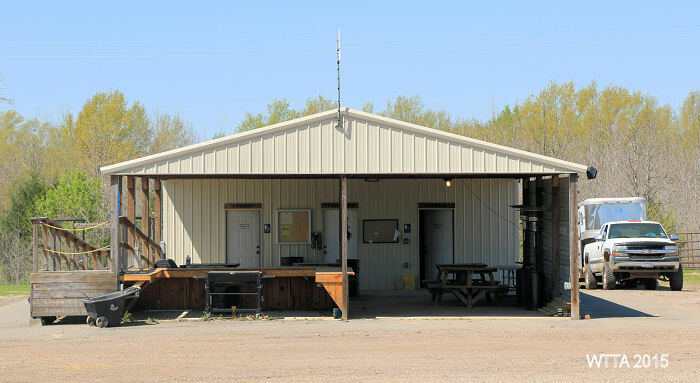 One of four pens at the group campsites 25 – 26. 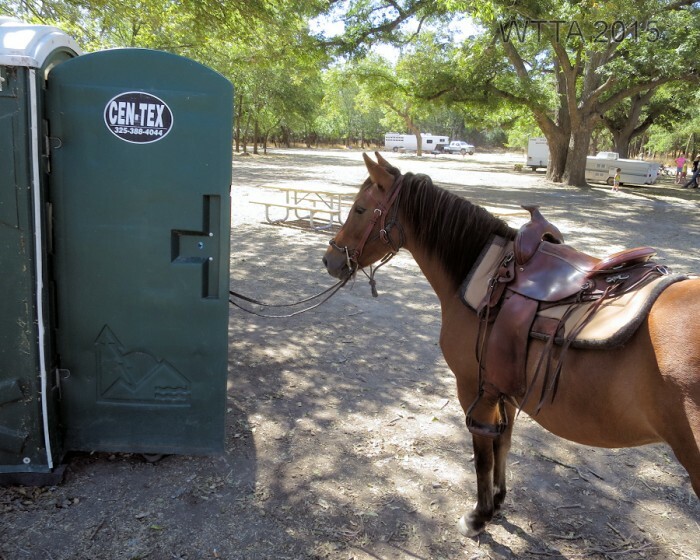 There is a porta potty at sites 15 – 26 but no hitching post, so you have to have your horse potty trained. Angel with her tongue out enjoying Lake Travis. 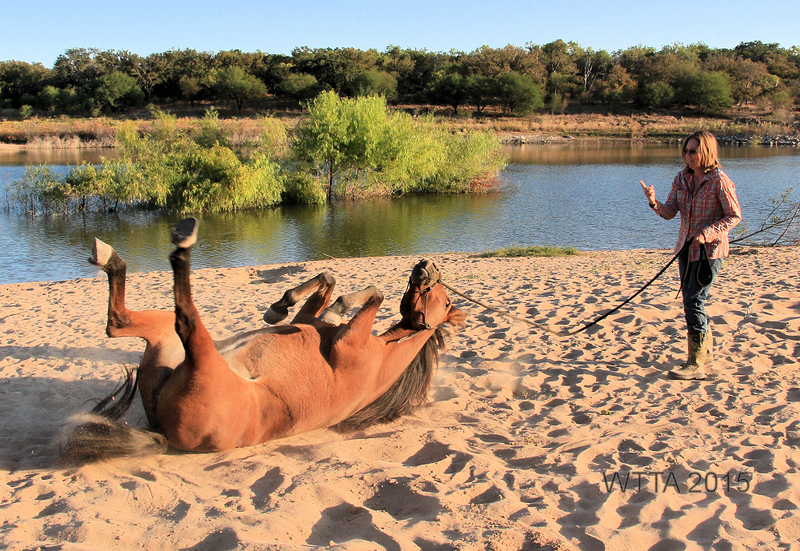 Midnight is enjoying a good roll at Lake Travis. Midnight and Kelly at Shaffer Bend. Angel and Chris looking great and enjoying the trails at Shaffer Bend. Camping neighbors enjoying the horses. 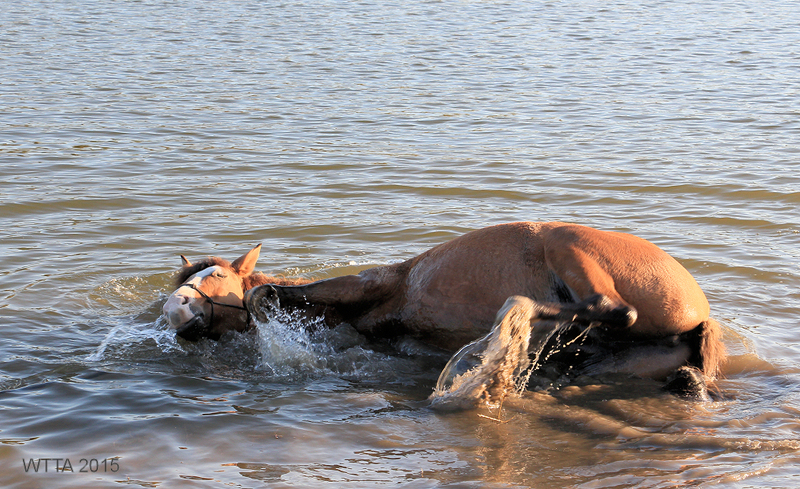 Angel’s taking one last dip in the lake before we head home. 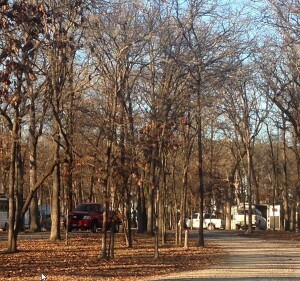 The Equestrian Campsite / Trailhead entrance. This point of view is coming from US HWY 69, turning east (right) on Loop 564, then look for the Mineola Wastewater Treatment Plant sign. Directions: From U.S. 69, turn east on Loop 564. To go to the Equestrian Trailhead/Campsite also known as The Derby, take your first right (this is not the main entrance to the park). Look for a sign that says Wastewater Treatment Plant. This road goes up a hill and you will see a small building where the fees are paid on the left and the pens and electric hook ups to the right of the road. Kelly Hurd, Curtis George, and Patricia Leopold ready to enjoy a day at Mineola Nature Preserve. 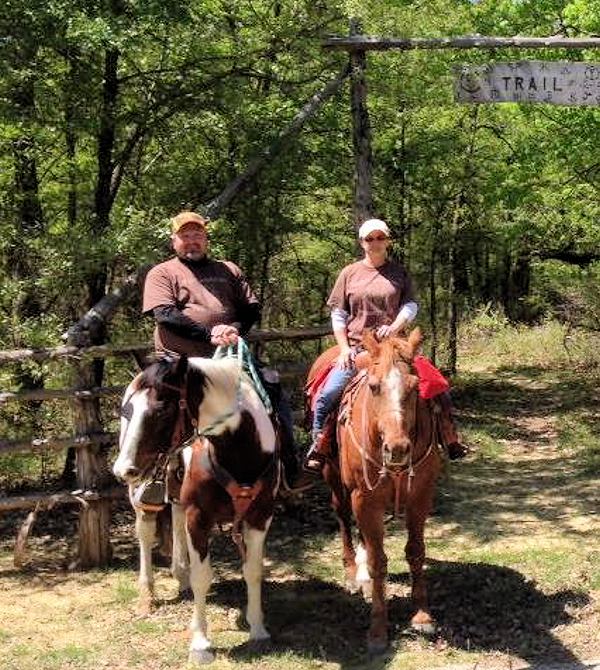 Trail boss and managers, Buster and Ginny keep the trails running and in good condition. 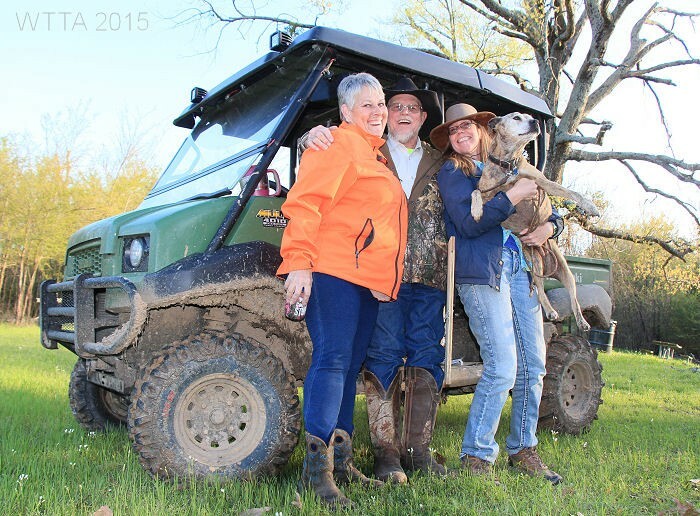 They kindly gave Chris and Kelly Hurd and their dog LB a tour of the park via their mule. 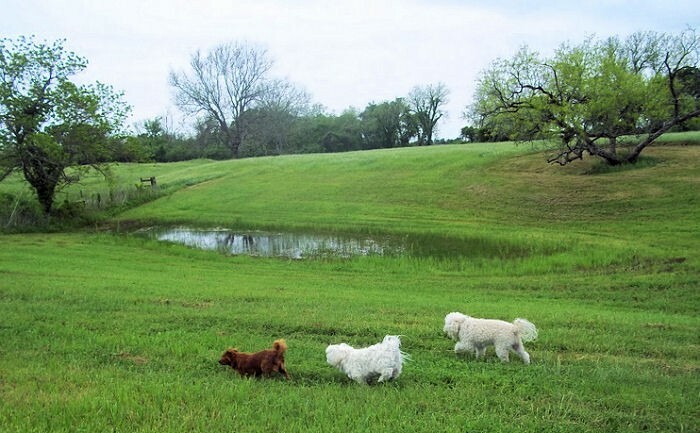 Left to right; Jenny, Buster, Kelly, and LB. 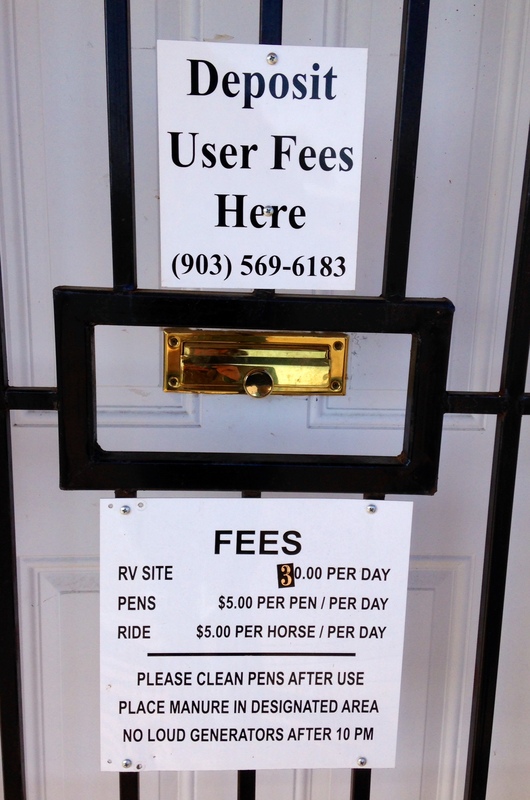 Fees: Use the door slot to the small building at the entrance of the Equestrian Campsite to deposit your fees. Fees are subject to change so please get confirmation on the most current fee requirements from the park. Equestrian electric/water campsites with pens. 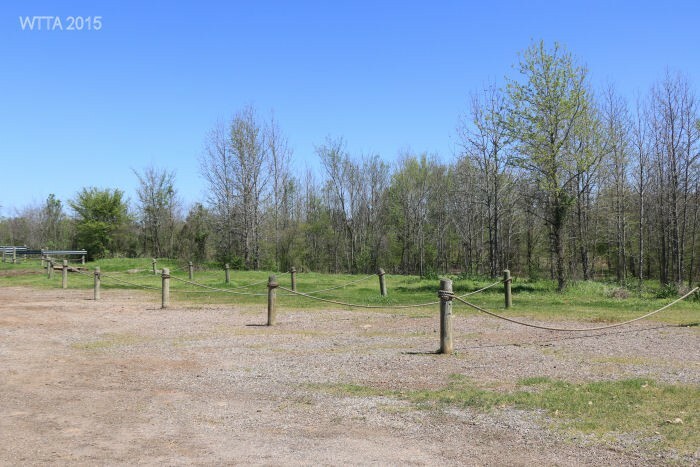 Facilities: 14 electric & water hook up sites with fire rings, picnic tables, and two side by side 12 x 12 metal panel pens per each site are provided at the Equestrian Trailhead/campsite. There is no shade in the electric/water campsites. These sites are separated by wooden posts and ropes. The parking pads are gravel. 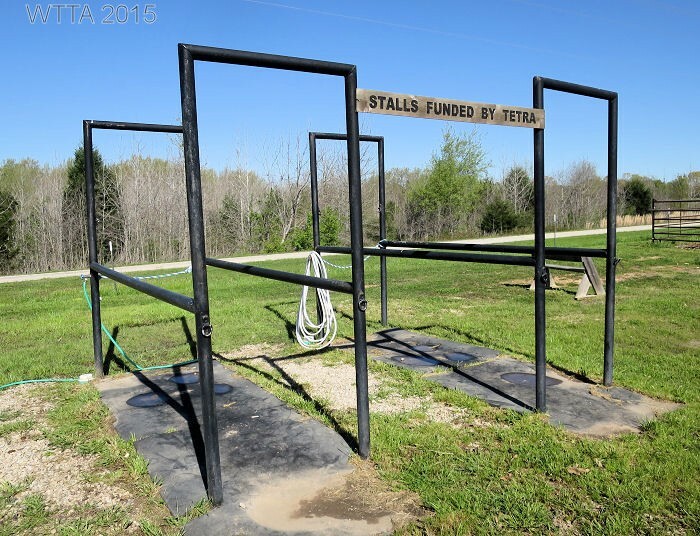 At this time none of the pens are covered, but the park is hoping to raise funds through ACTHA and TETRA rides to eventually get the pens covered. A water trough and two horse stocks, handy for bathing your horse, are also provided. The horse stocks were funded by TETRA. 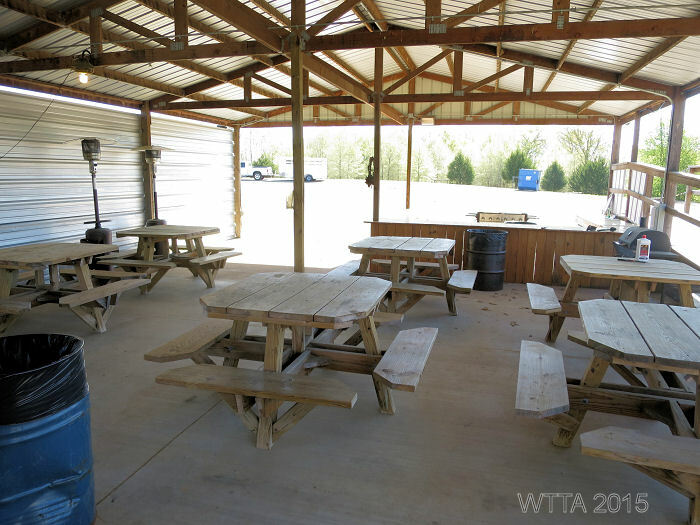 There is a large covered pavilion (The Derby Pavilion) with picnic tables, a bar, gas grill (bring your own propane tank), and a men’s and women’s bathroom which includes one toilet and shower each. The Derby Pavilion can be used at any time free of charge, or for a fee it can be reserved for a special occasion or event. 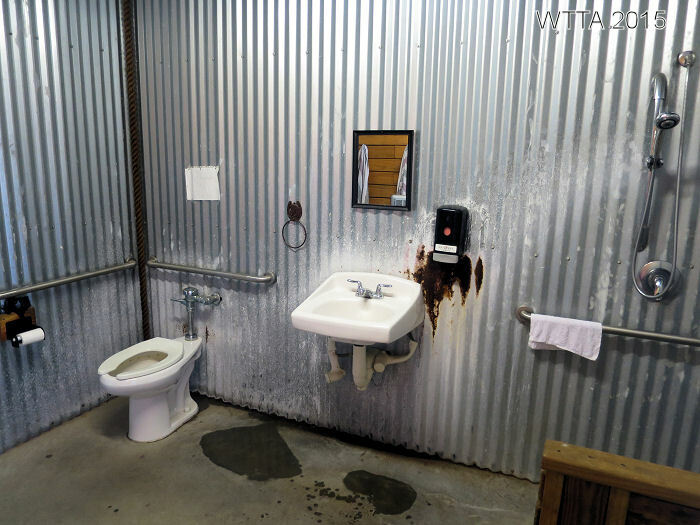 The men’s & women’s restroom/shower can be used by day riders or campers. On the side of the pavilion is a large and sturdy wheelchair ramp to be used for mounting. Mineola Nature Preserve is one of the very few places we’ve visited that has a wheelchair ramp for physically challenged riders. Bravo! 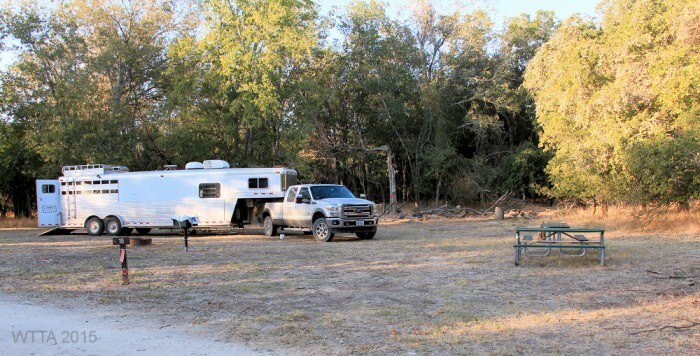 Between the primitive camping area and the electric/water hook up sites is a large open gravel open parking space. The primitive side of this area has several trees and is more scenic. There is a round pen in this area made of metal panels. There are a few pens which are constructed differently than the pens in the LQ/RV campsites. 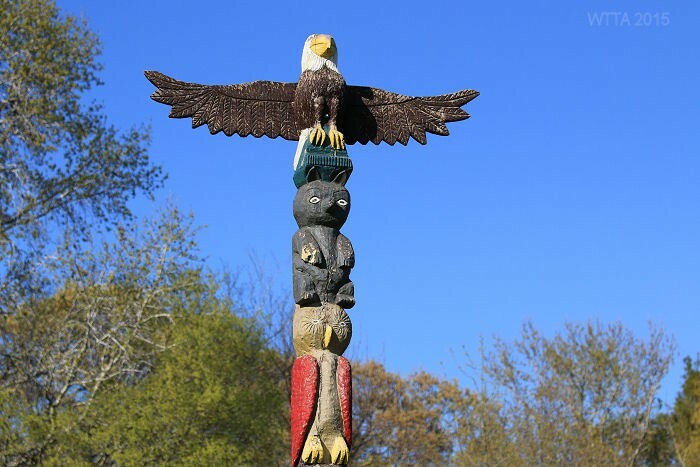 The couple of pens in the primitive campsites are made of wooden posts, guard rails, and rope. Pets/Dogs: Allowed, just keep them on a leash. Cell Phone Service: Fair to good. 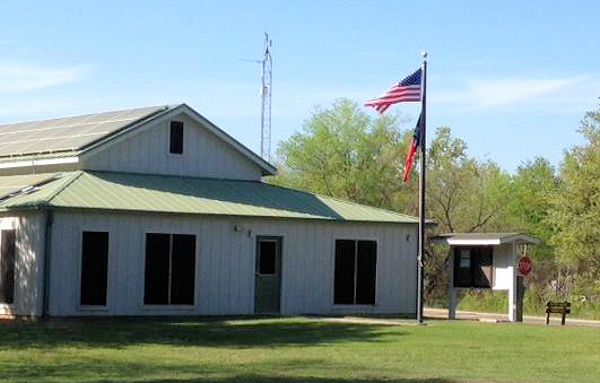 Hunting: The Mineola Nature Preserve trails close a few times a year for organized youth hunts. Outside of that hunting is not allowed. 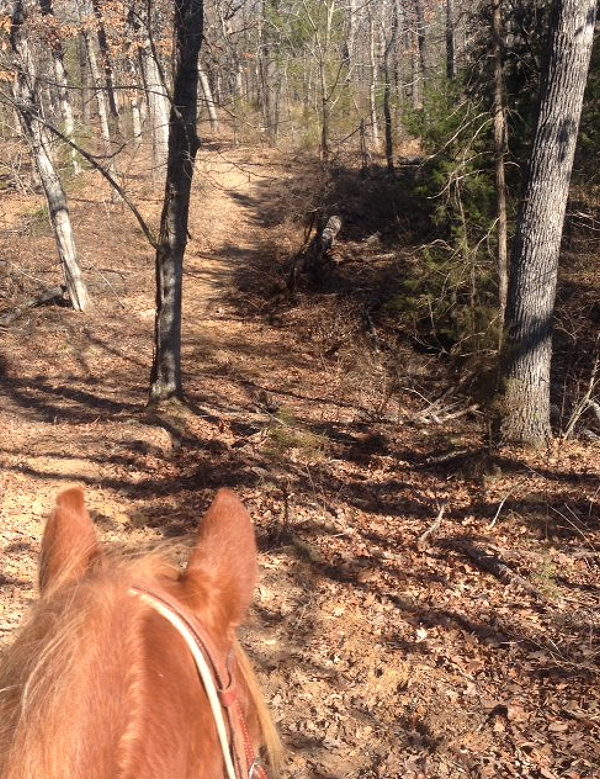 Trail Users: Trails are shared by equestrians, hikers, Boy Scouts, bicycles, and of course wildlife. No motorized vehicles are allowed on the trails, however, the trail boss does check and work on the trails via an ATV. 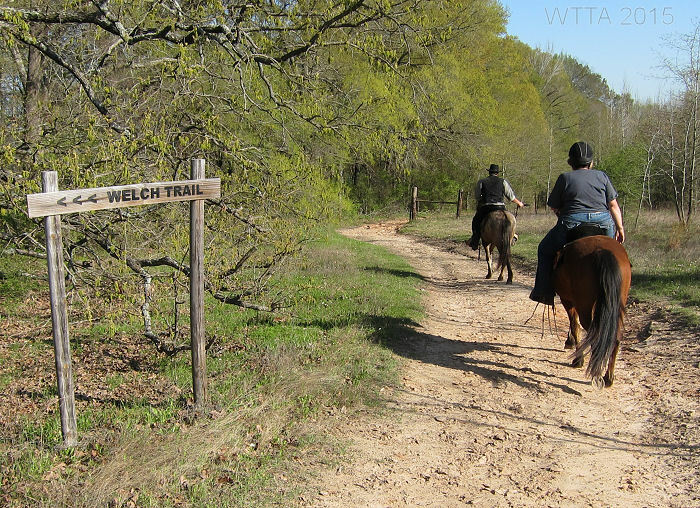 Equestrians are instructed to stay off of the railroad bed path (gravel walkway).Tthey may cross over it, but not ride along on top of it. 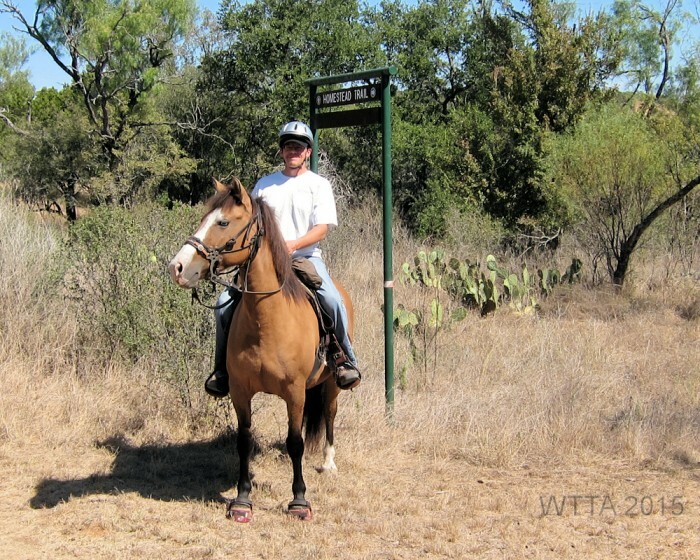 Mileage: Approximately 24 miles of equestrian/multiuse trails. Be sure to print out the map before leaving for your trip, as they may not be available at the park. 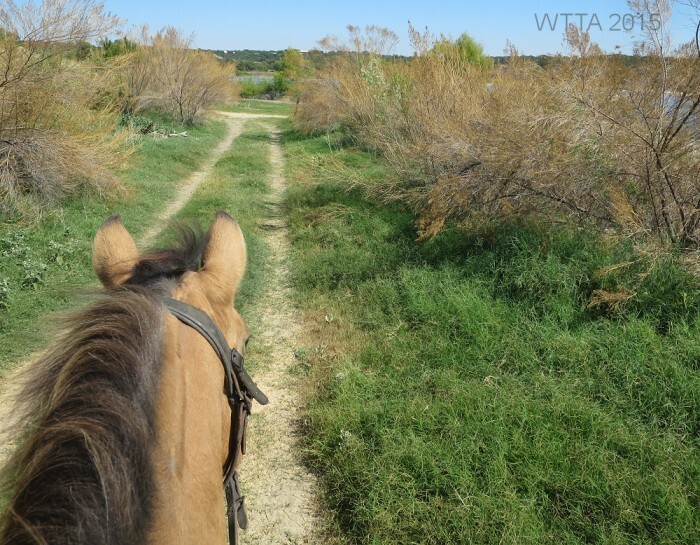 Terrain: Mostly sandy with only a few rocky areas; most horses will not require shoes/boots. Most of the trails are flat with some hills on the northeast side of the park. 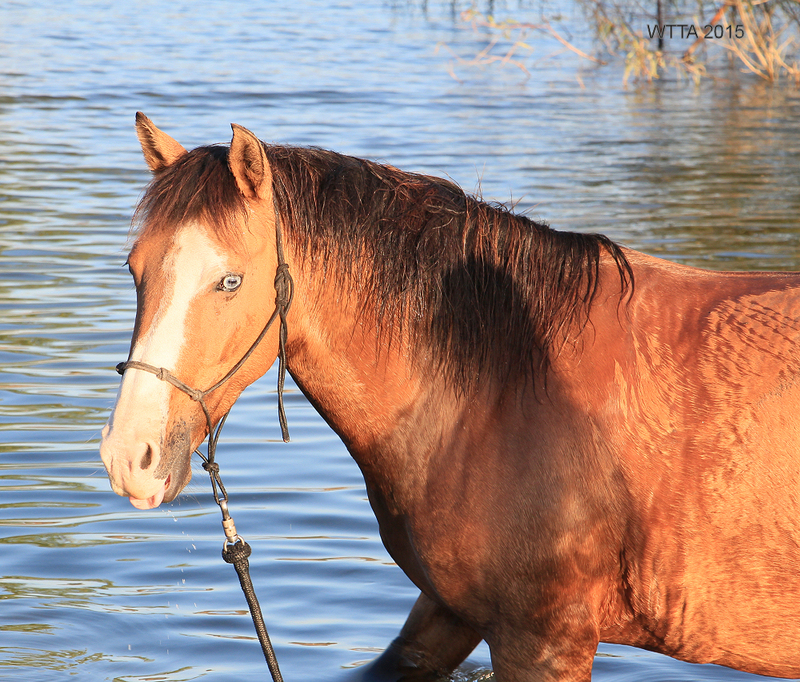 Water on Trail: Several creek crossings allow for multiple opportunities to water your horse while on the trail. 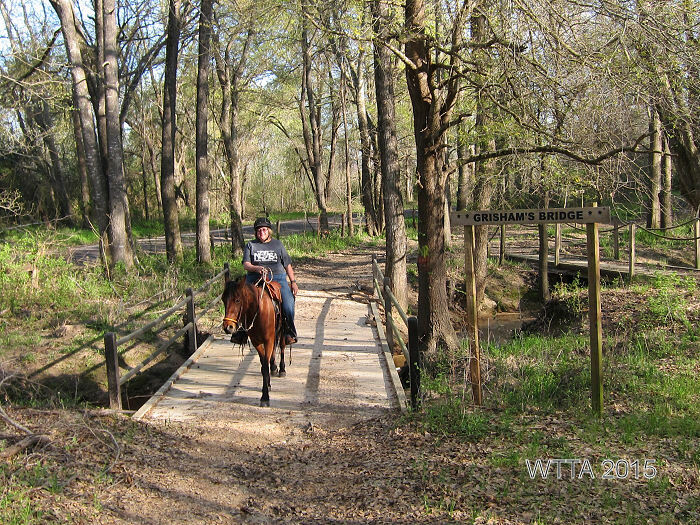 Patti and Dakota crossing Grisham’s bridge at Mineola Nature Preserve. Consisting of 2,911 acres in Wood County and along the Sabine River, Mineola Nature Preserve (owned and managed by the City of Mineola, TX) has over 20 miles of riding trails and is a great place for overnight equine camping. 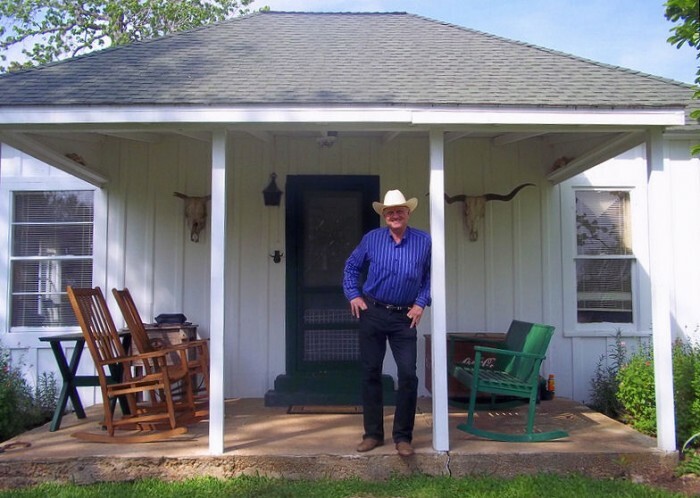 When arriving to the equestrian campsite at The Derby we were greeted by the park’s trail boss, Buster and his wife Ginny Green. They kindly introduced us to the preserve by taking us for a ride on their mule. When they asked if we wanted to ride on their mule my equine mind was thinking the four legged kind of course, but it was the four wheeled kind. 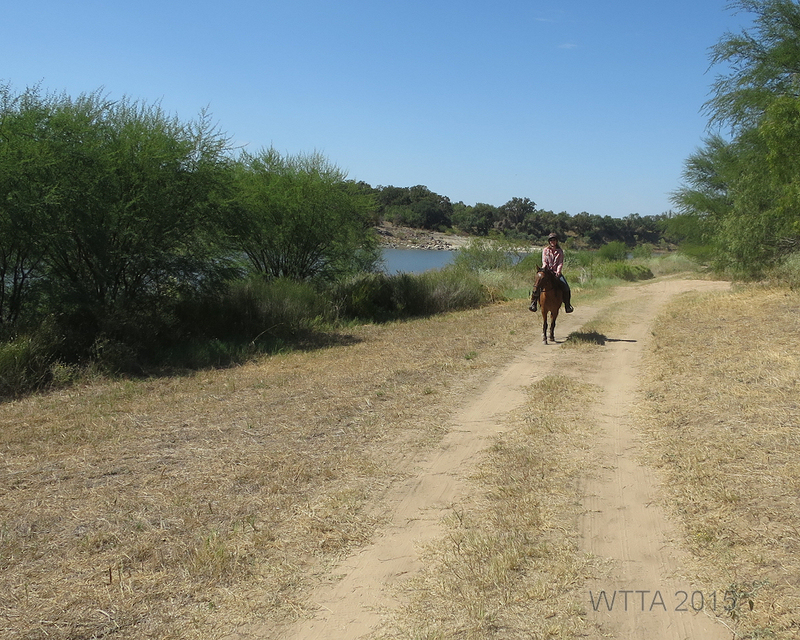 Thanks to the Greens I was able to see some parts of the park where equestrians can’t go, like along the Railbed walking trail and the really muddy lower south trails that we opted not to ride on for this trip. Buster and Ginny shared a wealth of history and tales about the area, unfortunately I could not hear every word due to the loud purr of their mule’s engine. 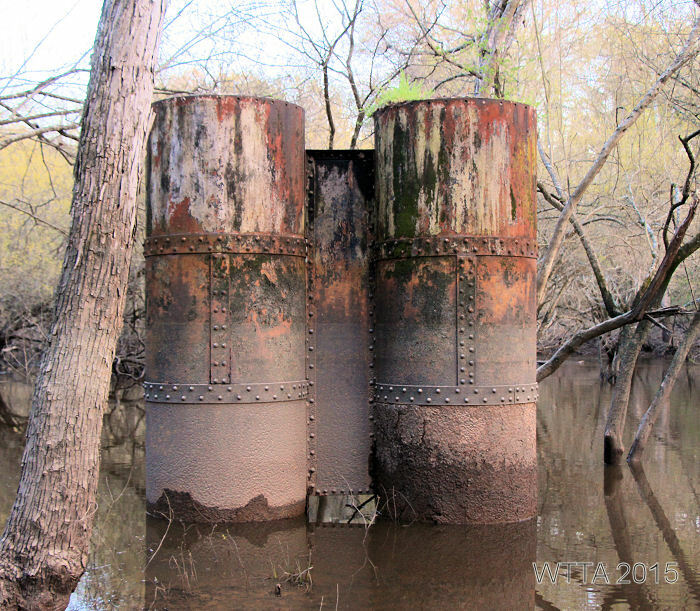 Remnants of the I&GN (International and Great Northern) and T&P (Texas and Pacific) railways which emerged in the 1870s are still evident today. Remaining metal and wood railway support beams spurred on my curiosity of what it must have been like to travel these railways in the late 19th century. The preserve has also installed educational signs detailing information about the land’s history along the trails. The Greens were excited to show off the beauty of the Preserve and highlighted how important the equestrian users are to the park. 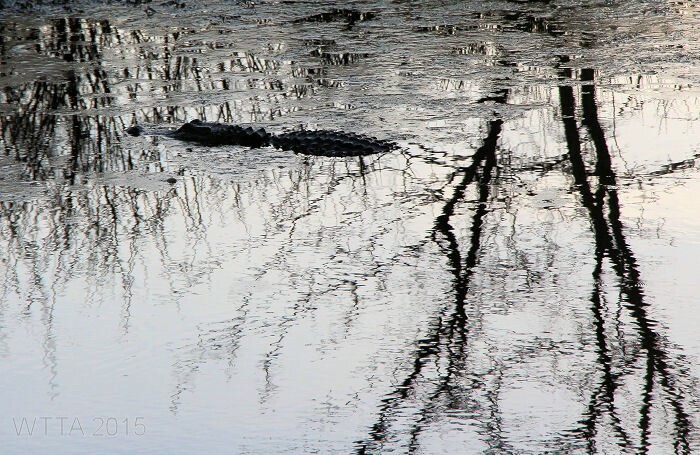 One of my highlights on this mule ride was seeing a resident alligator just before sunset, not a sight this south Texas gal often sees. Buster also took us up to Greer Hill which we later rode to on horseback as well. This area along with a few other spots in the Preserve have rest stops with a porta-potty, picnic table, and hitching post, which came in handy. 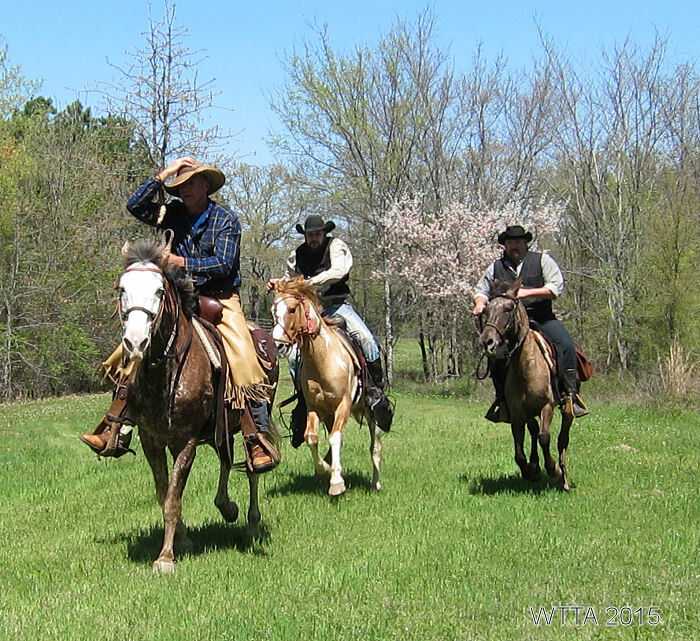 Kyle, Scott, and Curtis enjoying a fun gallop on the road to Greer Hill at Mineola Nature Preserve. A false pear tree is blooming in the background. Our early April trip to the Preserve was perfect timing to see the dogwoods and pear trees just beginning to bud. We met up with one of our favorite trail riding groups, NETASA, to explore the park in the company of friends who especially enjoy riding Spanish Mustangs / Indian Horses. Due to lots of rain this year, the lower south trails were just too muddy to be safe. We still ran into some pretty boggy areas but the north trails were usable. The Preserve trails wind in and out of East Texas forests, over bridges, through creeks, beside beautiful ponds, and into wide open fields. 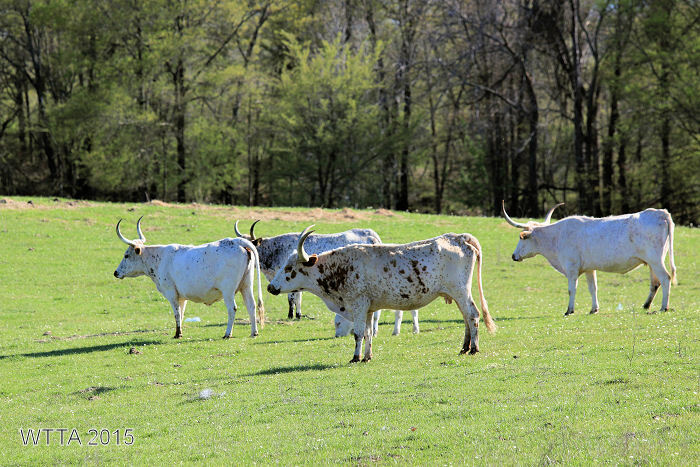 Part of the Appaloosa Trail travels beside a fenced pasture containing a few buffalo and longhorns. If you ride to the main park pavilion (not the Derby Pavilion) then you have a great view of the luscious grass filled senderos and beautiful ponds. I was curious as to what is a sendero and why were they created. So I just had to Google it. Ahead on the left and directly behind the pond are two senderos. 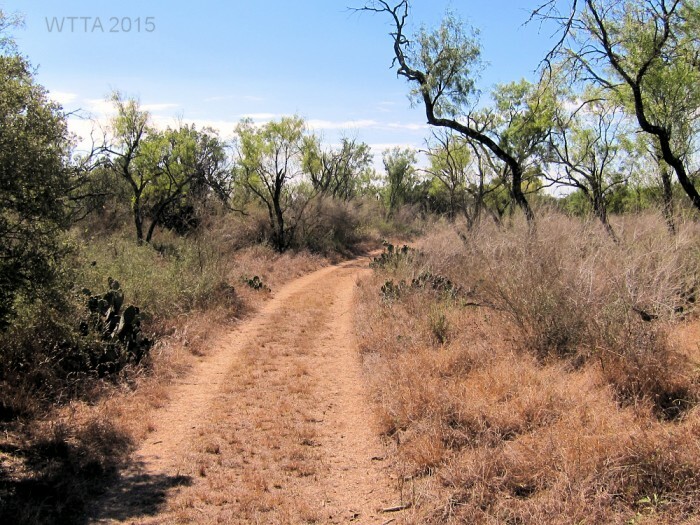 Here is the best definition of sendero I found by Arturo Longoria, “A sendero is a cleared pathway (always a straight line) through the woods or brushlands of south Texas and Mexico, often several miles long. 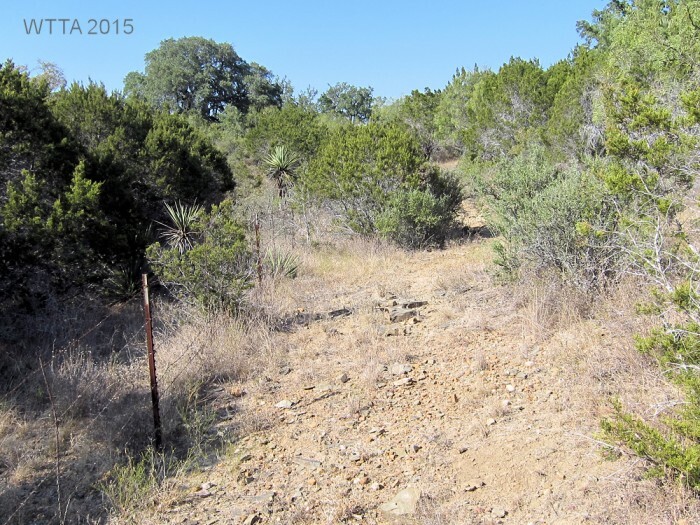 Not until bulldozers were used for oil and gas exploration did senderos become common place. Most senderos are from twenty to fifty feet wide, though some are as much as fifty yards across. Hunters often set up blinds along senderos to harvest deer as the animals cross.” Then Arturo goes on to note a quote from A Vaquero of the Brush Country by John D. Young and Frank Dobie, who said a sendero is “a clearing that will allow people to behold some of the secrets that the brush has hidden.” Oh how I love Google, now I know what a sendero is! 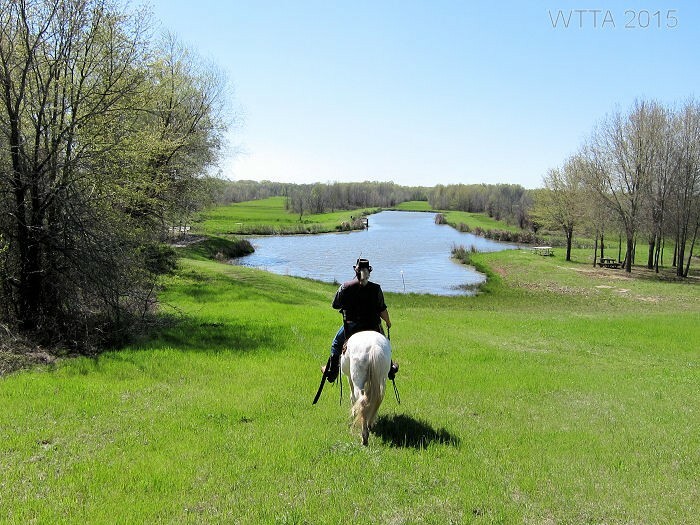 Even if you don’t ride, be sure to visit the park just to look down on the beautiful ponds and senderos from the backside of the main pavilion. Patti and Dakota crossing Big Foot Bridge. 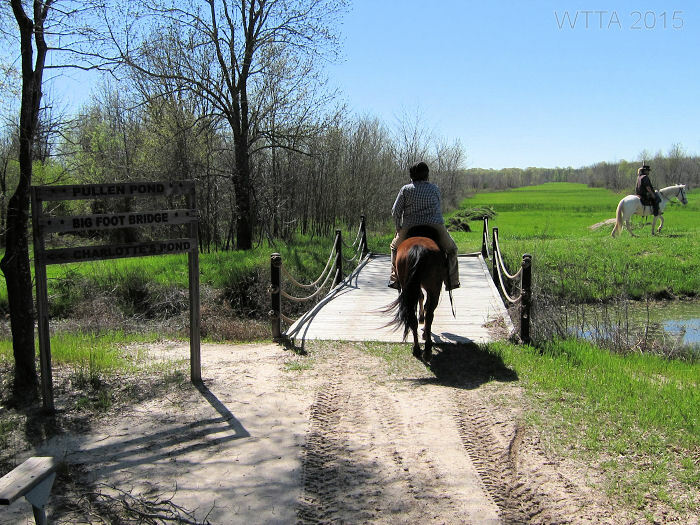 There are several bridges along the trails which are sturdy for crossing on horseback. Trails in the thick forest provide lots of shade, a welcomed respite from the hot Texas sun. Most of the trails are flat and sandy with some hills towards the northeast side of the park. Along the trails are great spots to stop and rest that have picnic tables and a port-a-potty. 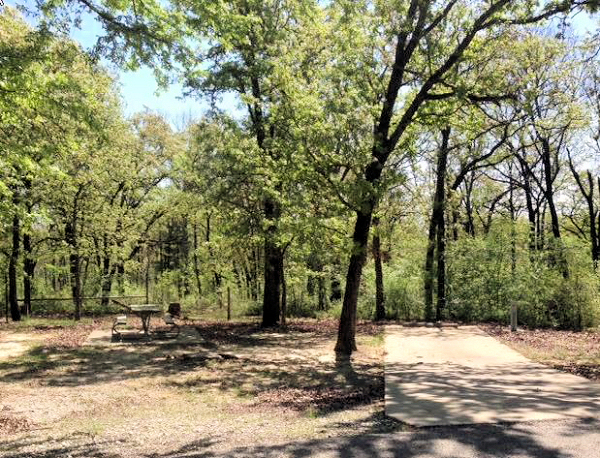 One of these spots is at the top of Greer Hill which is a lovely well-shaded area with picnic tables, hitching posts, and a portable restroom on the north side of the park. 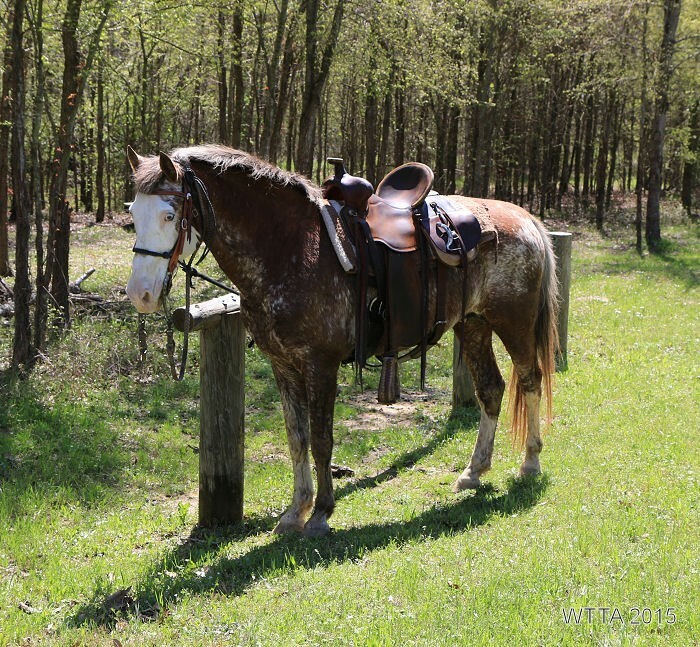 Kyle Germany’s flashy Spanish Mustang, No Myth, waits patiently at the Greer Hill Hitching post. The trails are shared by equestrians, hikers, bicyclists, and wildlife of course. We did run into a pack of feral hogs on trail, which was interesting. They sounded like gorillas. 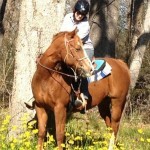 Our horses did not think highly of the situation but we managed well. The only motorized vehicle allowed is Buster’s mule as he uses it along with his horses to check and maintain the trials. 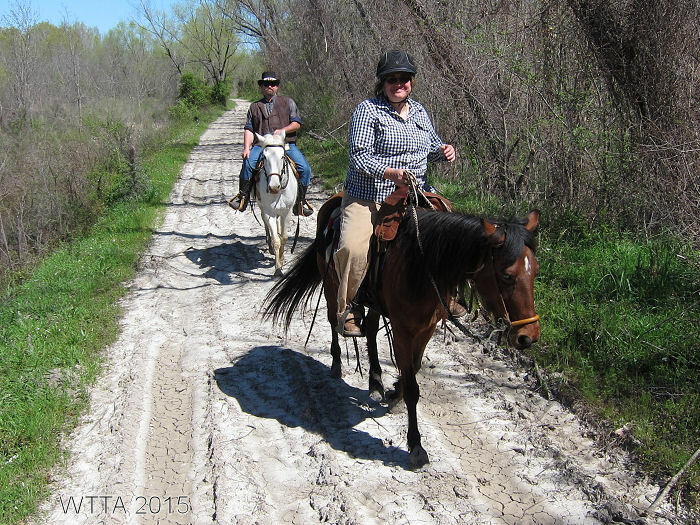 Equestrians can ride just about everywhere except on the gravel Railbed Walking trail. You can ride next to this trail when it is dry enough and you can cross it if you need to. Judy, Kyle, and Scott enjoying the Mineola trails. The facilities are really nice and the pavilion at the Derby (equestrian campsite) is perfect for gatherings. We enjoyed several tasty meals and a few games of Chicken Foot under the covered pavilion. The large men’s and women’s bathroom/showers are amenites not often found when camping. The only down side for me is the lack of trees and shade for the electric/water campsites. 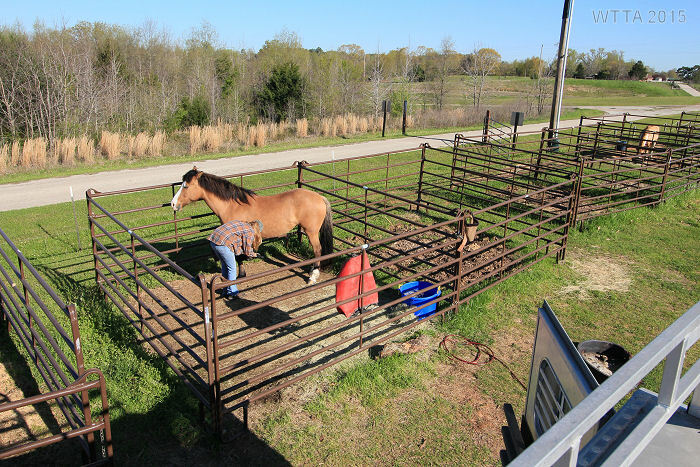 However, there are plans to put shelters over the pens to give the horses some shade. I also was not crazy about the water treatment plant being just down the road from the campsite. Currently there is some construction going on near the camping area as well, but this is temporary. These are minor issues when looking at the whole picture. 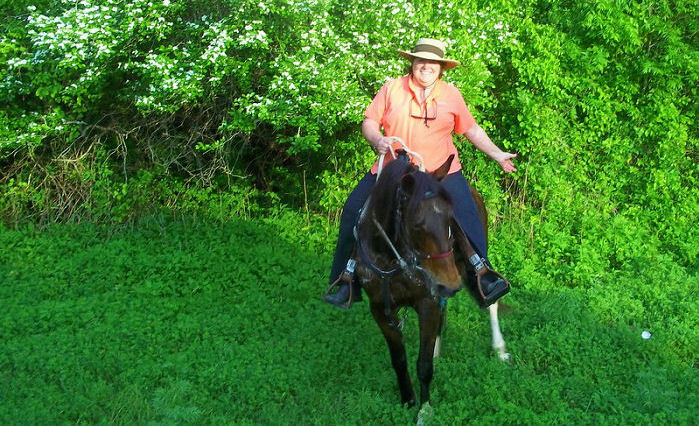 All and all, the Mineola Nature Preserve is a great place to enjoy and camp at with your horses and friends. 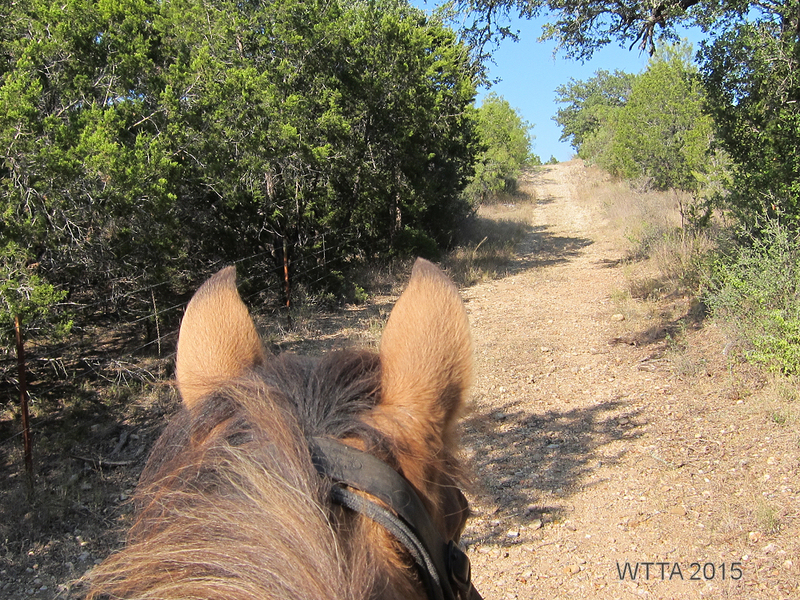 I am thankful to have such a resource available for trail-riding equestrians. N.E.T.A.S.A American Indian Horsing riding club getting a group photo at Mineola Nature Preserve. 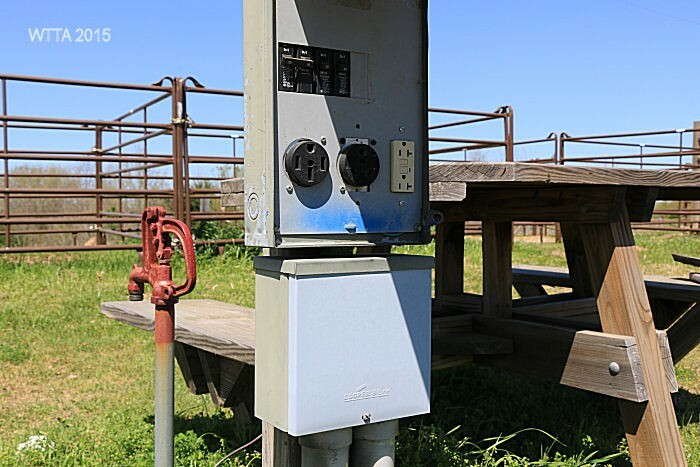 Equestrian electric/water with pens camping sites. Electric / water camping sites. Overhead view of electric / water campsite. Two pens for each electric/water hookup site. 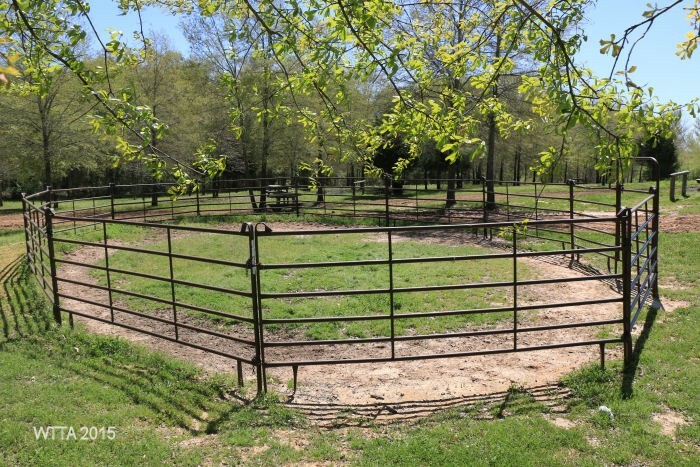 The round pen is across the gravel parking lot in the primitive camping area. Primitive camping sites, some are on grass and a few are on gravel. There are a few pens in the primitive camping area; they are constructed differently from what looks like guard rails, rope and wood posts. Wash rack / stocks provided by TETRA. The Derby Pavilion has a men’s and women’s restroom with showers. 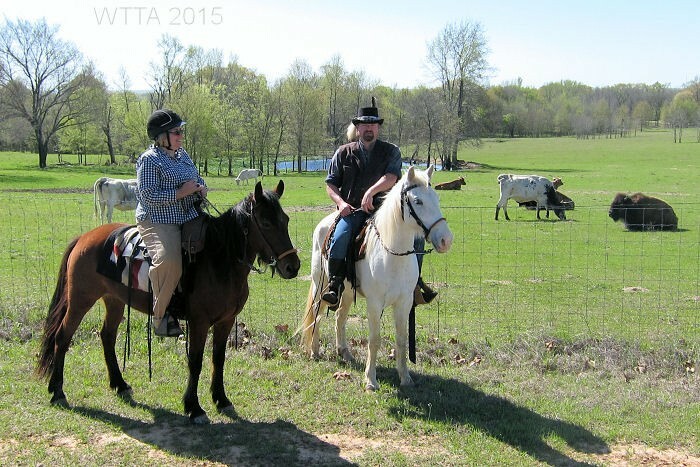 Patti and Curtis on Appaloosa Trail. Buffalo and longhorn seen from Appaloosa Trail. Longhorn at Mineola Nature Preserve. On the road at Mineola Nature Preserve. Old Railroad support beams. The trails here are gravely. 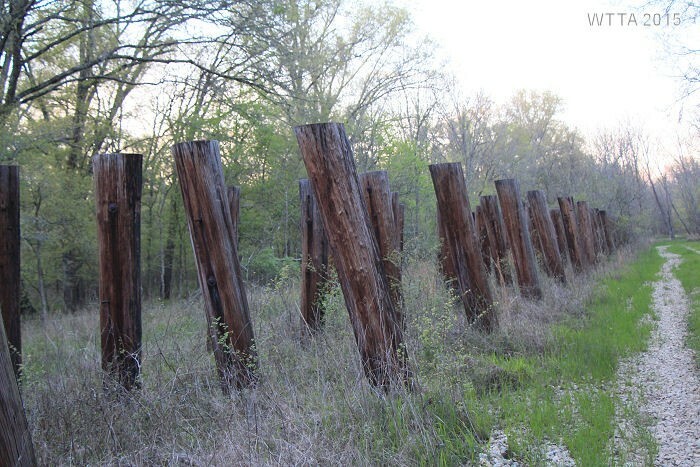 Old metal railroad support beams at Mineola Nature Preserve. Thanks to Buster and Ginny we got to see the resident alligator. 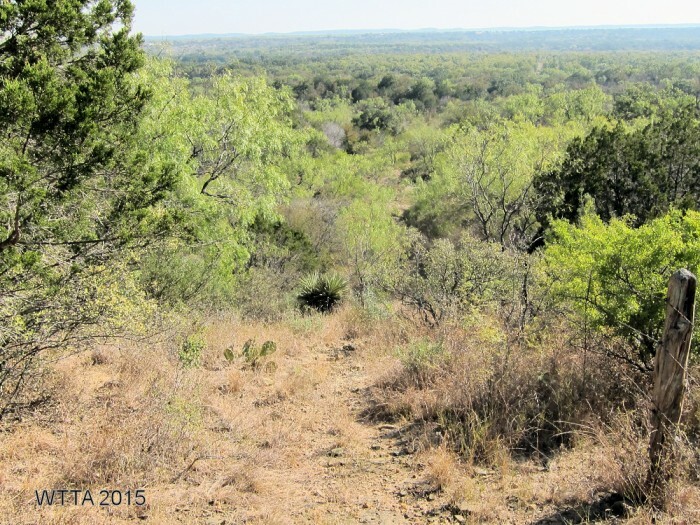 Contributor: Trail review and pictures provided by contributor Ann Sides. Thank you Ann! From Greenville, take I30 East toward Sulphur Springs. Take the Hwy 19 exit (Exit 122) and cross over I30 and go north. This is also called Loop 301. You will loop around Sulphur Springs, and will go through several stop signs. When you come to the intersection of Loop 301 and Hwy 19, go to the left (north). At Birthright, turn left on FM 71 and go 4 miles, then turn right on FM 3505. You’ll see signs that say Cooper Lake when you’re back on Hwy 19. After you go past the Rangers’ station, take the first left. This is a long winding road that will take you to Buggy Whip Equestrian Camping Area. The last sign for Buggy Whip Equestrian Camping is on the left side of the road. If you miss it you can keep going straight and easily turn around. The camping area is laid out in a large loop, with camp sites all around the loop. There is day parking along the center of the loop. You can also access the South Sulphur Unit from Commerce but the road is more narrow and twisty. 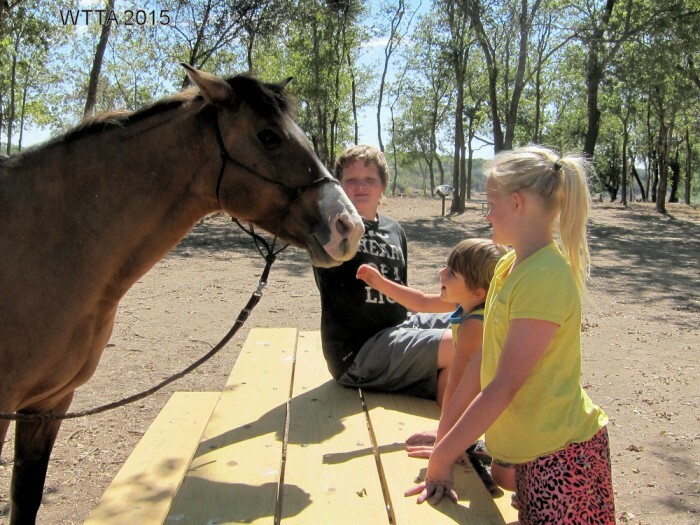 Equestrian Camping: There are 15 concrete camp sites with water and electricity. Two of the sites are made for double trailers, which is really nice if you’re traveling with someone. The sites are spaced out with trees and bushes between the sites making them feel more private. Each site has a metal post picket system in the shape of an H with 20 ft cable across the top to tether horses. This camp doesn’t appear to be as busy as it was in past years, but reservations for camping are recommended. A typical camp site; very shady with nice concrete pads. 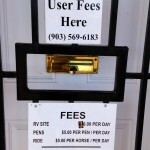 Fees: $5.00 for day use. 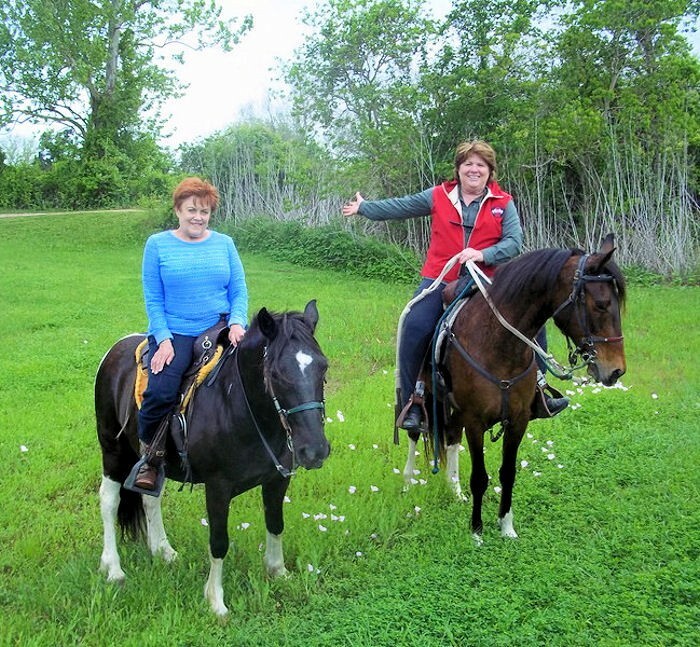 $20 per night plus day use fee for equestrian campsites with water and electricity. Coggins: You will be asked to present a current Coggins at the Ranger Station prior to entering the park. They will inspect your horse to insure the papers match the horse. Facilities: The road in camp is asphalt and is in the shape of a long oval. It’s also very flat, which makes it a great place for kid’s to ride bikes. 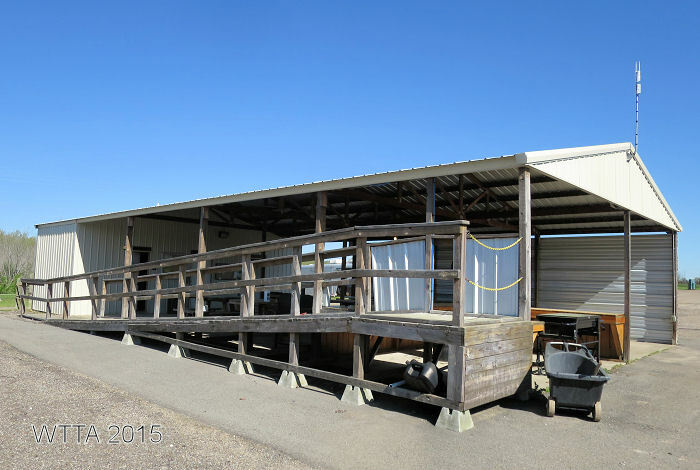 The equestrian camp has a very nice bath house with men’s and women’s facilities with multiple showers, sinks, flushing toilets, and is heated in cold weather. It is always clean and well cared for. 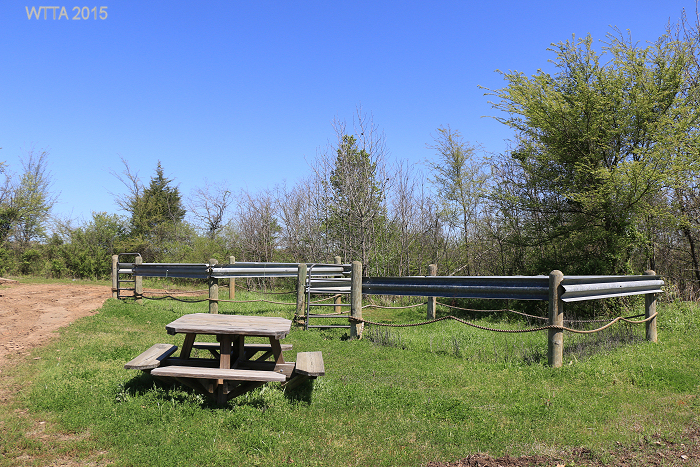 There are picnic tables and fire rings at each campsite. 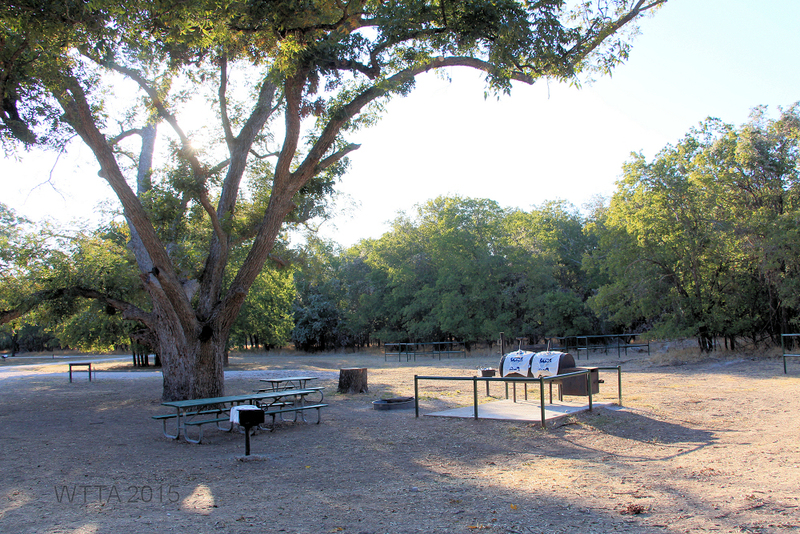 The park has many separate camp sites, some with shelters and others for camping or RVs. 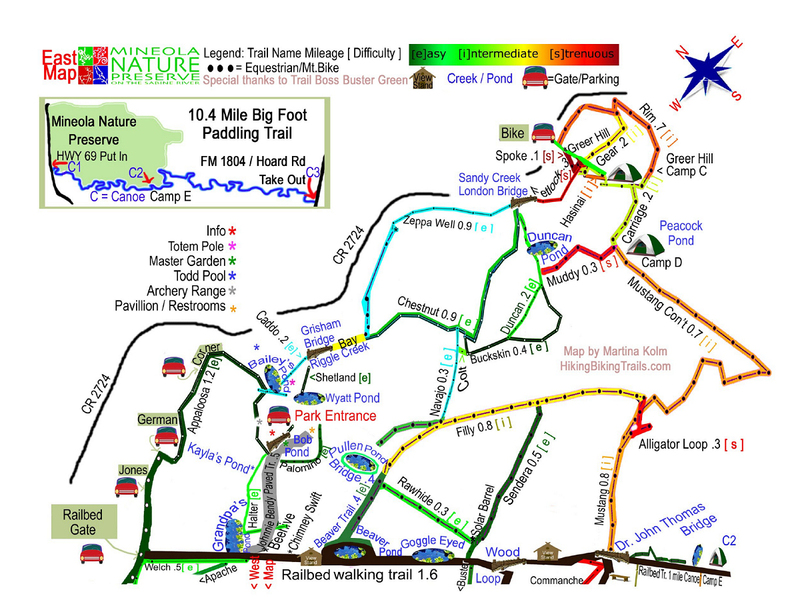 There are many hiking trails and nature talks are also offered at times. 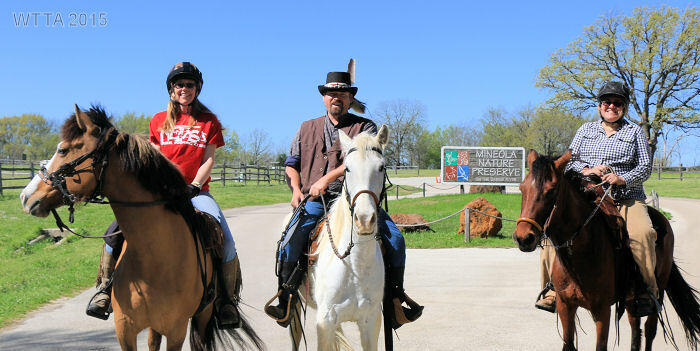 Check with the ranger station for non-horse related activities. Cell Phone Service: ATT has good service. Mileage: The Buggy Whip Equestrian only trail is 10.55 miles. Trail Map: The current trail map you receive at the front gate doesn’t have trail numbers marked on it. I’ve written them in on the new map using info from a previous map. Terrain: Sandy clay with some rocks. Most horses are fine without shoes. The soil erodes very badly so when there is rain the trails are closed. If in doubt, call the ranger station before you haul. Description: The Buggy Whip Equestrian trail is primarily in hard wood forest with some ups and downs. There is access to the lake on one portion of the trail. Be prepared to see deer and possibly wild hogs. There is no hunting in the park and the deer certainly seem to know that! The park has really worked hard in the recent years to alleviate erosion by rerouting trails and adding supports in the trails. 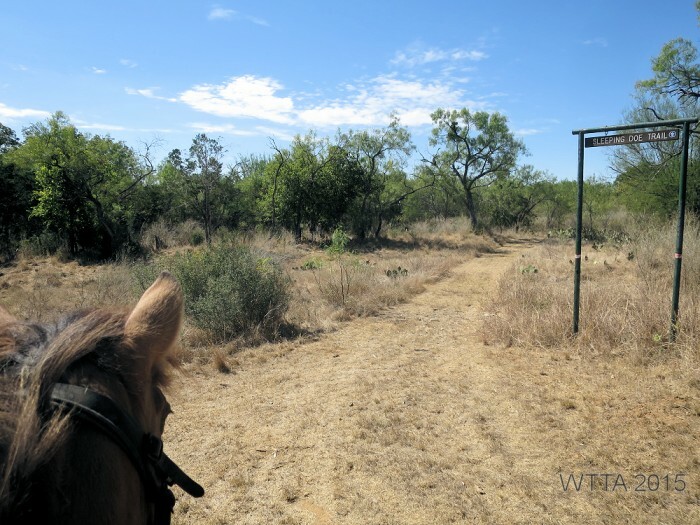 Buggy Whip Equestrian Trail: There are basically 3 areas of trails. On the new map the area closest to the camp is called “Novice area”. 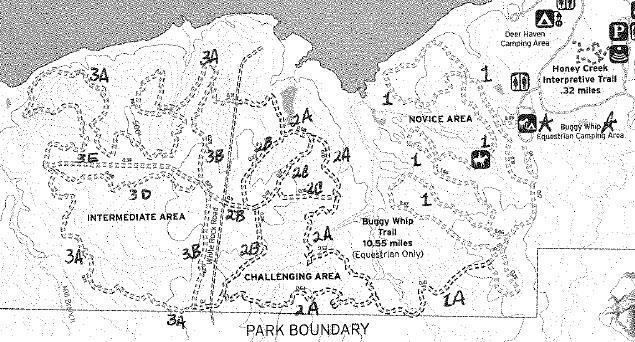 These are easy trails and are comprised of 3 large long loops. From these trails there is a single crossing over into the next area. This crossing is a low bridge in a creek, but it is good footing with mild slopes on either side. Some inexperienced horses/riders may have problems with this crossing. This creek crossing was very dangerous for many years with an open bridge and steep slopes. Hats off to the park for changing this crossing and making it very safe. The 2nd area is called “Challenging” on the new map. After you cross the bridge the trail will fork and the trail to the right has some steep inclines. If you have small children or inexperienced riders, I’d definitely recommend avoiding this section of trail. On the map the trails that fork are BOTH called 2A so if you want mild riding go to the left. The pond near the north end of Trail 2A is very boggy. The 3rd area is across a white rock road. The majority of these trails are relatively flat and wind through trees. Please note, the numbering on the trails can be somewhat confusing. The far trail is called 3A on both the north, west and south loops. If you’re one of those folks who like to know where they are, it’s a good idea to orient yourself with the sun before you take off. Trace Trails in Athens, TX, Caddo National Grasslands near Telephone, TX, and Cooper Lake State Park in Sulphur Springs, TX. Ann Sides – Thank you Ann! 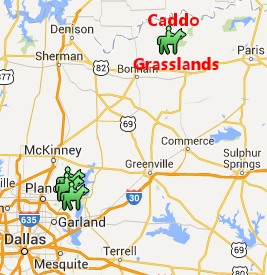 Location: Caddo Grasslands is about an hour and a half northeast of Dallas. 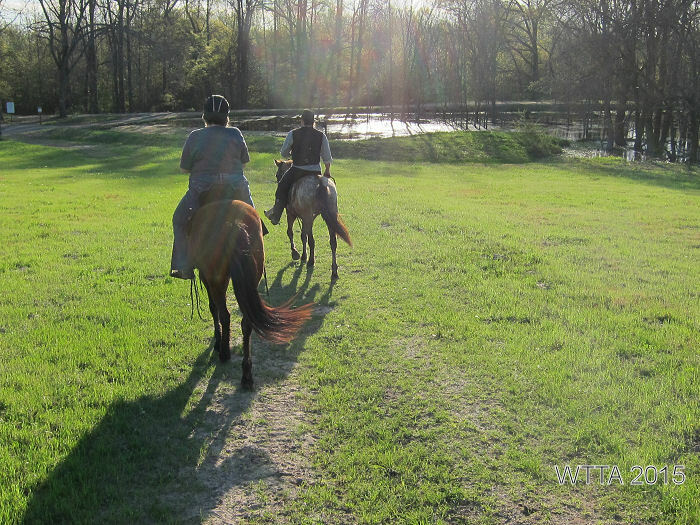 When you come to Caddo Grasslands, plan on getting away from it all and enjoying some of nature’s beautiful scenery and great horseback riding. Just FYI, in case of emergency Paris, TX is the nearest large city with emergency facilities. Go out North Hwy 69 to Leonard. Turn right at Hwy 78. Stay on 78 through Bonham to FM 1396. Turn left on FM 2029 approx 3-4 miles. Turn right on FM 409 and go approx 2 miles. You’ll see a brown sign that says Bois d’Arc Trailhead. Entrance is on the right side of the road, with a cattle guard crossing. Mapquest will show some little FM roads that skirt around Ladonia and one after Bonham, especially on the FM around Ladonia (twisty and narrow). It is a much better drive pulling horses to stay on the bigger roads. Current Coggins is required but is not usually checked. There is no ranger station at front gate. Photo provided by Ann Sides. 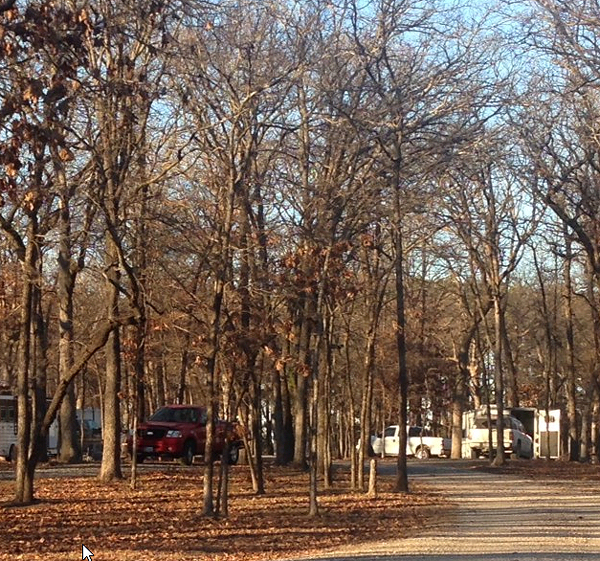 The road in the camp is gravel and all campsites are shaded. There are approximately 20 pull through sites and 10 pull in sites. 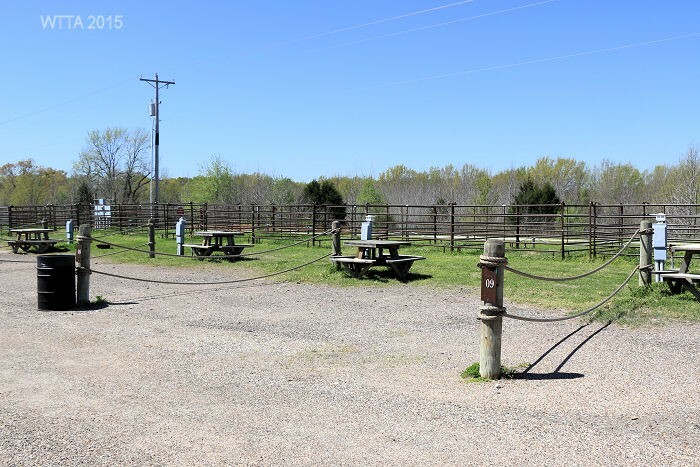 Each campsite on the outer side of the loop has a large picnic table, and either a single pole to tie horses to or a steel highline with a cross piece. The single poles are being replaced with highlines. 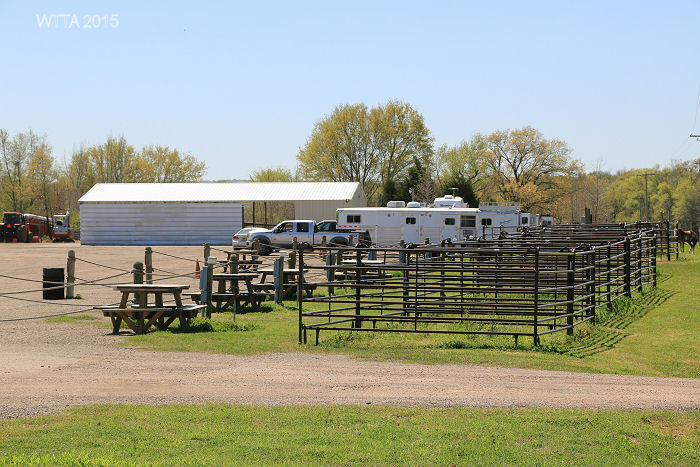 Other amenities at the campsite include a large covered pavilion with picnic tables, a composting pit toilet, a large water trough, a horse wash rack and a mounting block for handicap riders. All campsites have frost free faucets with water available year round; however there are no showers or electrical hookups. 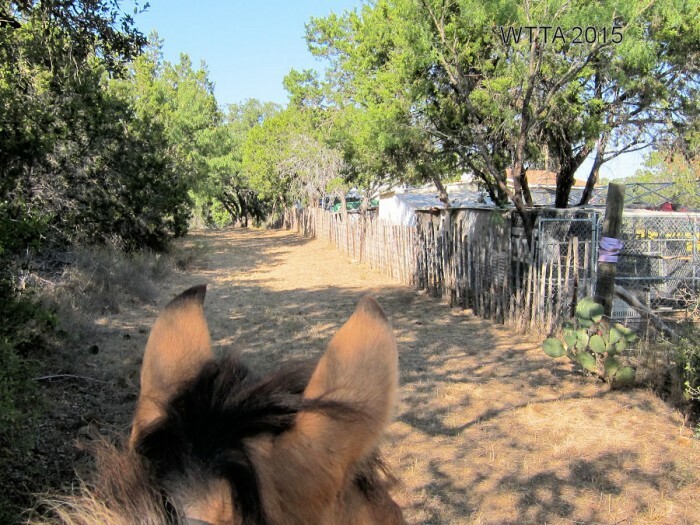 You can tell this camp was designed by horse people, for horse people, as all facets of the campsite are horse friendly. There is day use parking down the road from the main trailhead. It is primarily used when there are large group meetings. 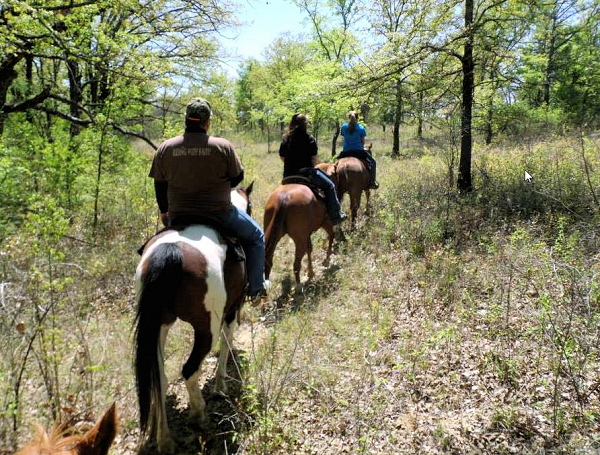 The work on the campsite began in 2000 by a volunteer riding club, Caddo Trail Riders Association, who still maintain and improve the trails and campsites today. 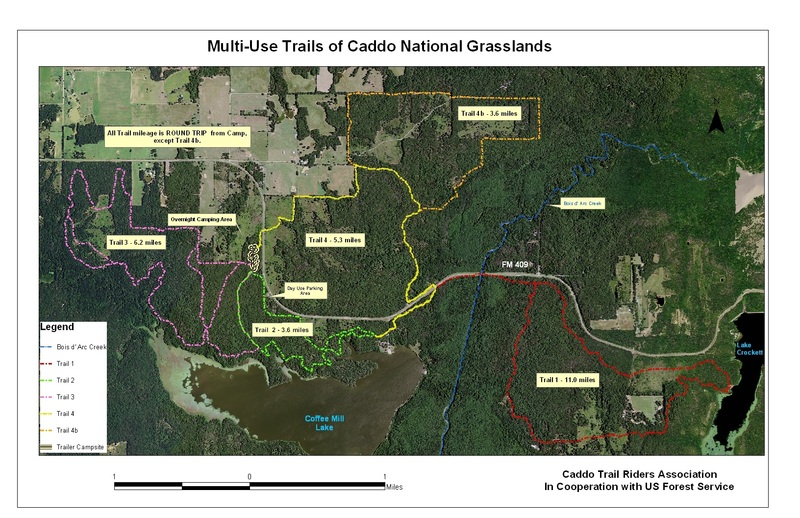 Their website (Caddo Trail Riders Association link) contains up-to-date maps and phone numbers of members you can check with about weather and controlled burns (more on this later). Dogs are allowed but must remain on a leash. Cell phone service is fair. 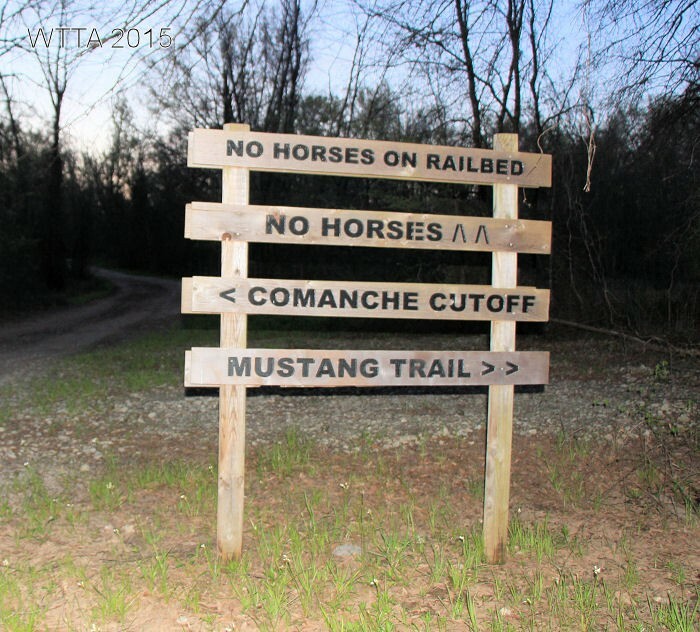 This is a multi-use trail for Equestrians, hikers, hunters, and bicycles. However, due to the sandy trails there are rarely if ever bicycles on trail. Hunters typically hunt. in areas away from the trails. Trail users are required to wear orange during dear season. No motorized vehicles are allowed on the trails.. 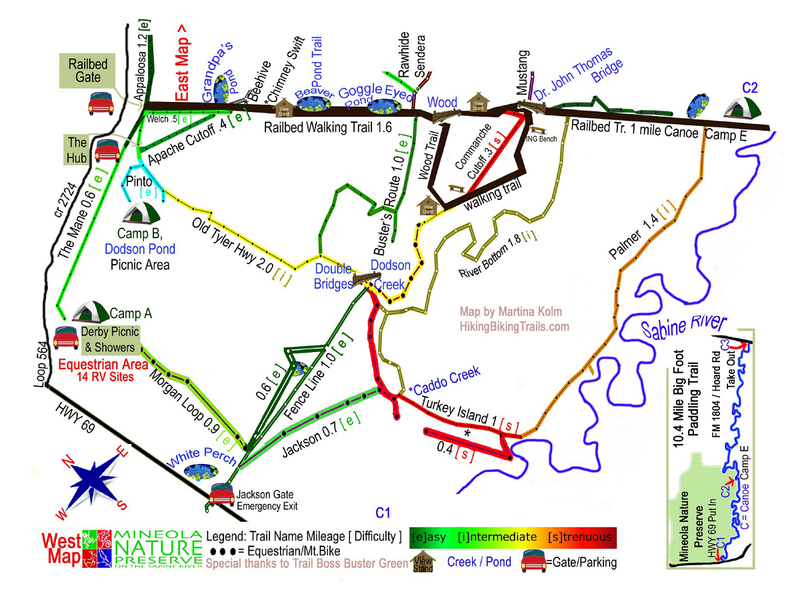 There is approximately 30 miles of trails. Click the map to enlarge it. 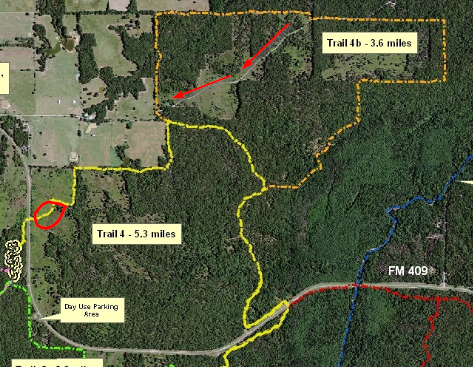 According to Caddo Trail Riders Association, trail maps are available at the campgrounds. CTRA also reports that the trails are well marked. The terrain is sandy, heavily wooded, and hilly to flat. These are barefoot friendly trails. 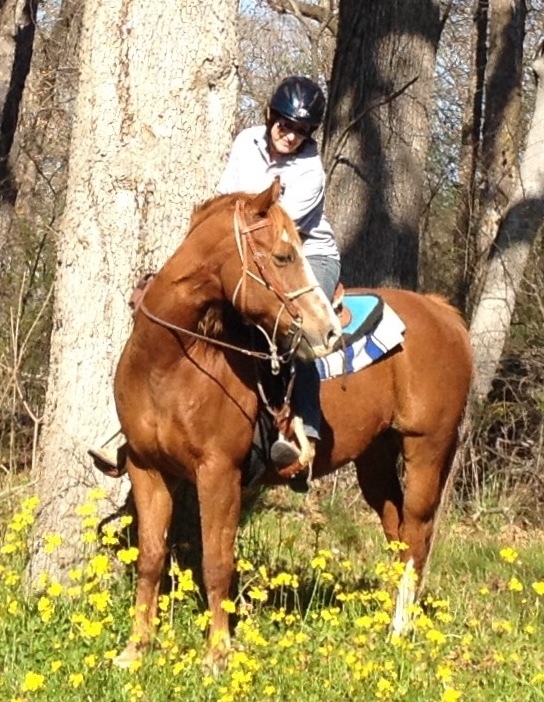 When most equestrian folks hear “grasslands” in Texas they think of the Grasslands in Decatur. However, there is another grasslands area that together with the Decatur area comprises the Caddo-Lyndon B. Johnson National Grasslands. 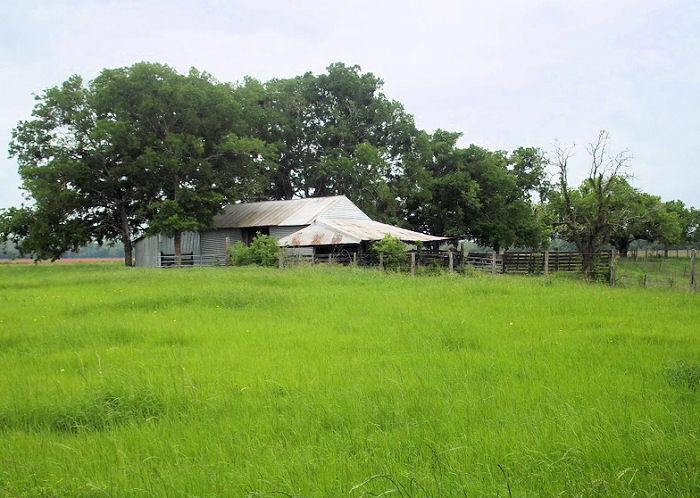 It is located near Honey Grove and called Caddo Grasslands. 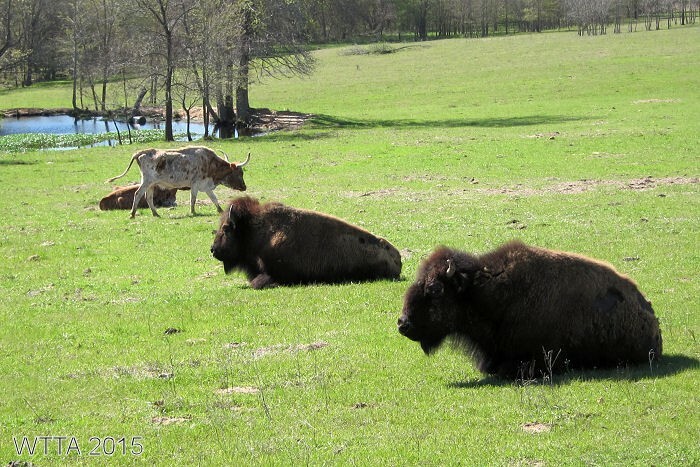 Caddo Grasslands has nearly 18,000 heavily wooded acres and three pristine lakes. It is open for hunting and fishing (following TX Parks & Wildlife seasons), camping, hiking, picnicking and horseback riding. 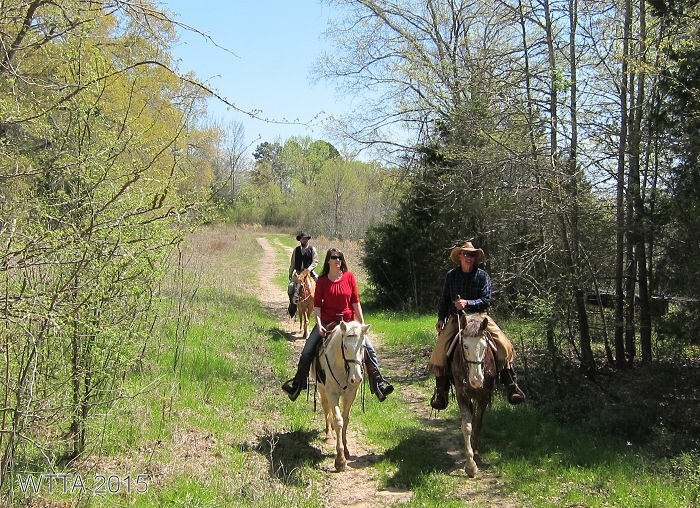 Equestrian riders will find 30 miles of shady, sandy trails and a comfortable campsite at Bois D’ Arc Trailhead. 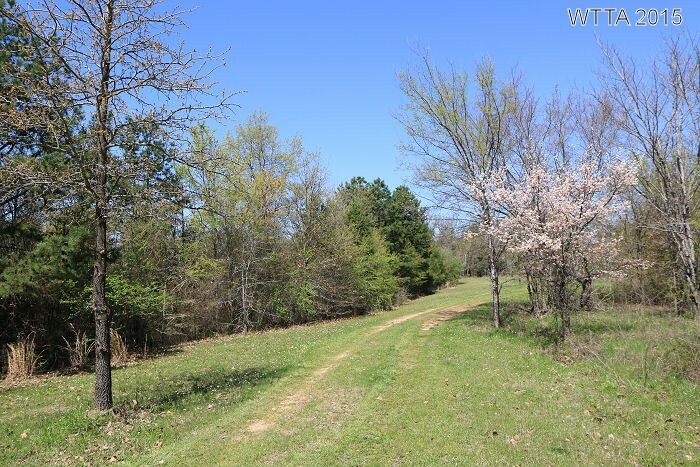 There is additional acreage near Ladonia but it has not been developed for recreational use. Trail 1 is 11.0 miles and for years I was warned this trail was very rough. I finally rode it with some friends who had ridden it before and found it’s a wonderful trail!! It had lots of up and downs which I really like. To access Trail 1, go out Trail 2 and take Trail 4. You’ll cross a small road into a camping area with horse gates on both sides of the road. After about a quarter mile you’ll come to another horse gate that goes out toward the road. Go out this gate and ride by the fence to the right. You’ll need to cross the bridge on the highway and go a short distance to another horse gate on your right. This is not a busy highway and has good visibility. This is a long trail and it is ideal to bring along a lunch and stop at the lake overview to eat, where there is a picnic table. The 11.0 miles includes the portion of Trail 2 and Trail 4. If you desire to shorten your ride back a little, you can ride along the highway all the way back. It’s pretty boring and is not maintained for horses, so be wary of holes or other hazards. Trail 2 is the shortest trail at 3.6 miles. However, it is very scenic with a stop by the lake and a trek through a large stand of pine trees. This is a very nice trail and is relatively flat. Trail 3 is the next longest at 6.2 miles. It is similar to Trail 1 but has more up and downs. There is a cut through on the trail to use if there’s been a lot of rain and is shown on the map. 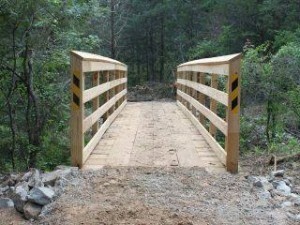 There is a very sturdily made bridge on this trail that is good training for your horses. Trail 4 is 8.9 miles. This trail is located across the highway from camp but there is good visibility at the crossings. The west side of the trail has some areas that are not shaded. On the north end of the trail is a new trail that’s been recently opened, called 4b. I’ve been told it’s the best trail there. 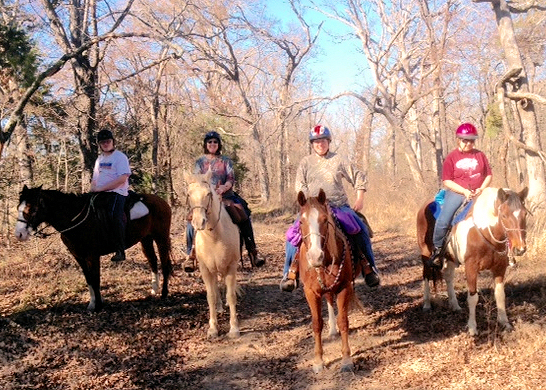 With the weather bumping the 70s a group of us went up to Caddo Grasslands and decided to ride Trail 4 and 4b. We didn’t have any trouble closing gates as we had a pro side passer ride with us, who not only side passed with ease but did so while ponying another horse!!! The road crossing went well with gates on both sides of the road. The terrain is gently rolling hills, with moderate ups and downs and most of it was through lovely forests with sandy trails. One of the really nice things about Trail 4 is if you have a group that some riders want to do a short ride and some want to do a longer ride, it’s easy to split up and one group do the inner circle and the other group do the outer circle. Our group stayed together but we found some of us getting a little tired so we cut off part of Trail 4b by riding a gravel driveway, shown by the red arrows. From there it was an easy 1 mile back to camp. The trails were VERY well marked and maintained. The area shown in the red circle is across an open field and if there had been a recent rain it would have been very boggy. 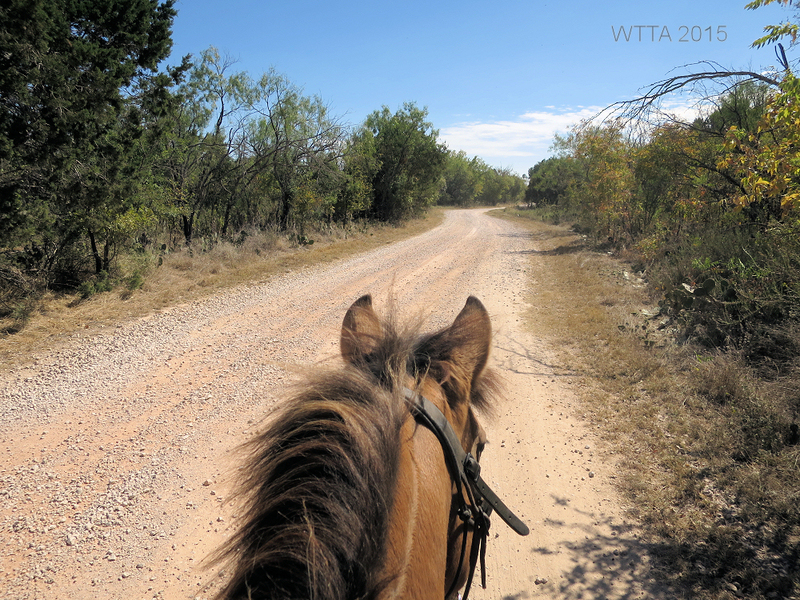 The trail itself was dry but one horse got off the trail and it was boggy even though there has not been rain in several weeks. Note on controlled burns. Occasionally the National Forrest Service determines the forest is getting too dense with underbrush and they’ll do a controlled burn. In a controlled burn the flames are only about a foot tall and they basically cut through small trees and bushes and clear out the undergrowth. Sometimes the trees are supported by other trees’ branches and do not fall. This can be a hazard immediately after a burn; especially if it’s windy. Also, as you can imagine its not real pretty after the burn. If you’re planning a long stay and/or a long drive, be sure and check dates for controlled burns with the Forrest Service at Decatur (940-627-5475) or with the Caddo Riders Association. Andrew, Ann, Julie and Judi on Trail 4.